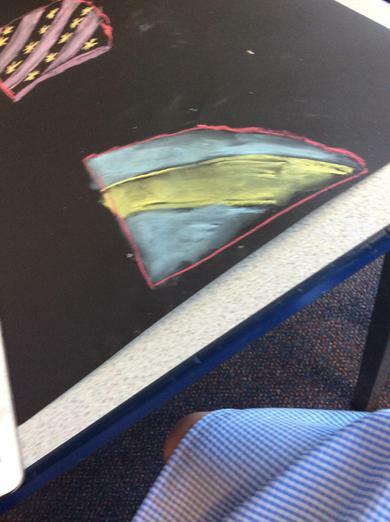 Our class display is looking wonderful - thank you 3B! 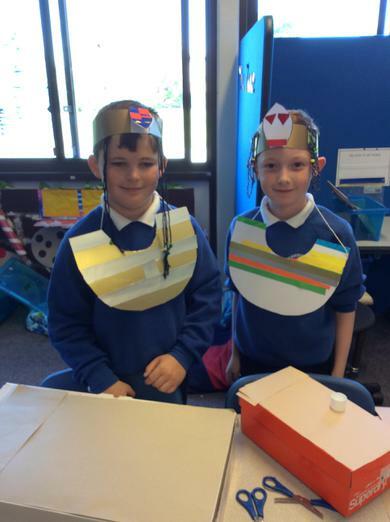 We had fun on Egyptian day. 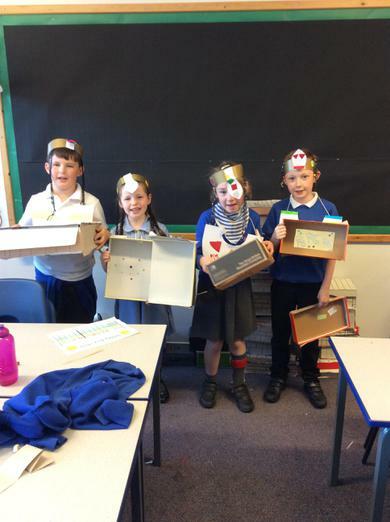 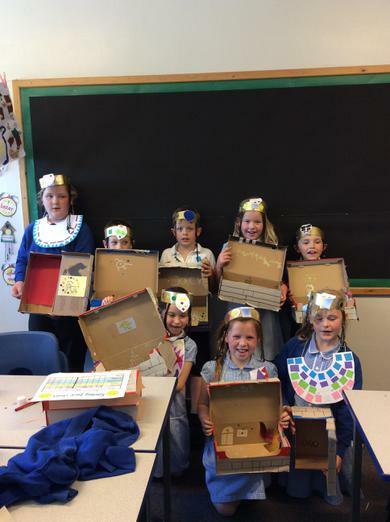 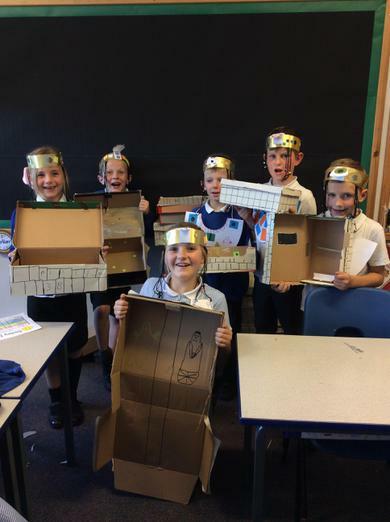 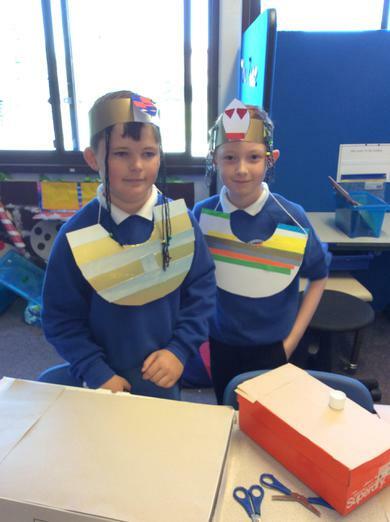 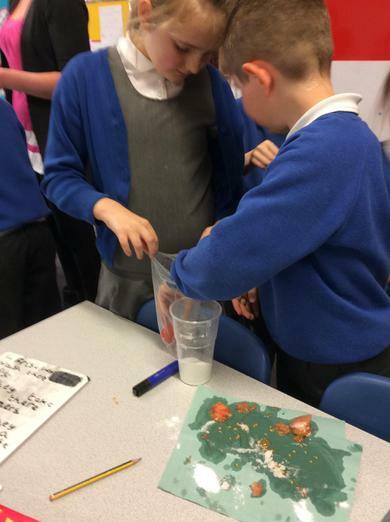 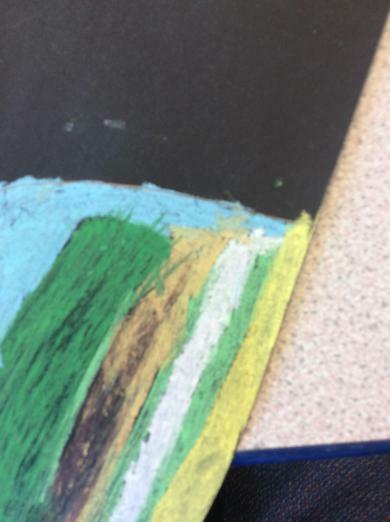 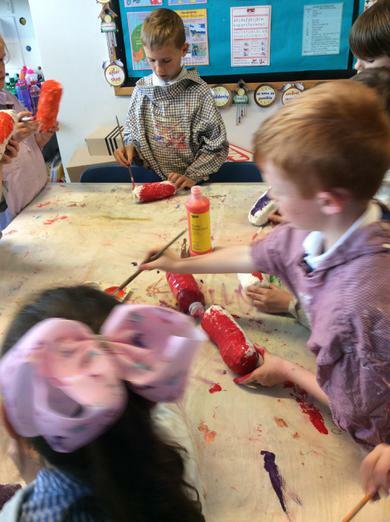 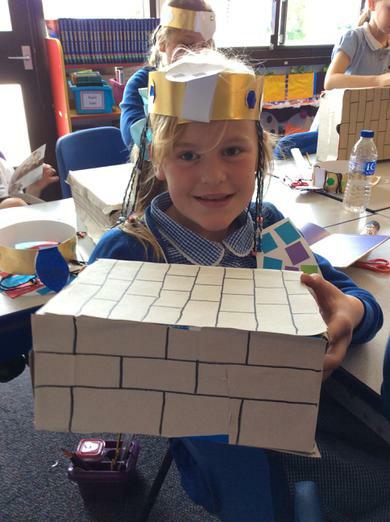 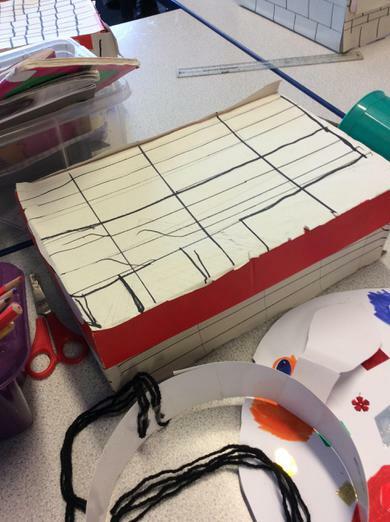 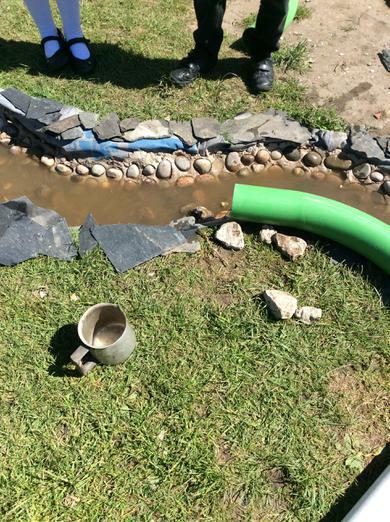 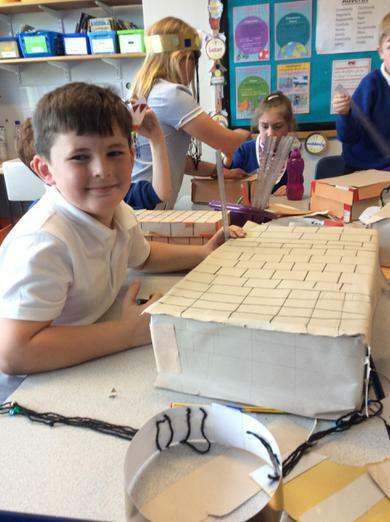 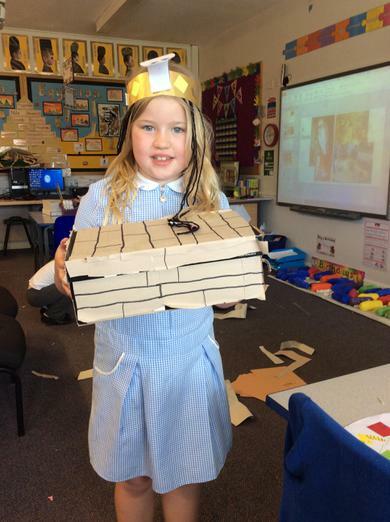 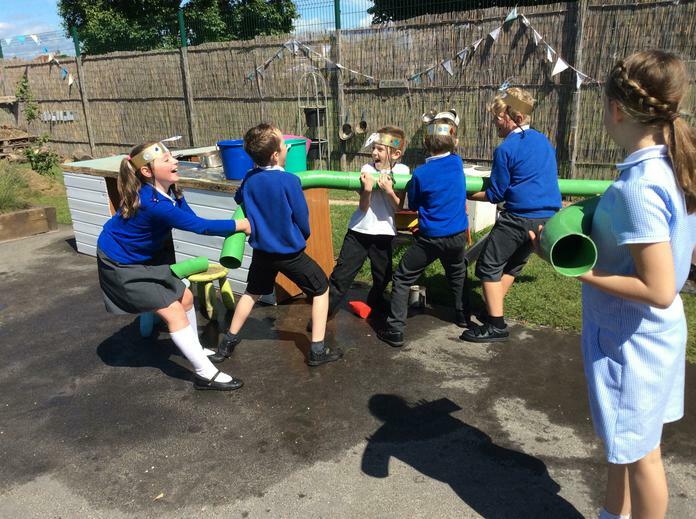 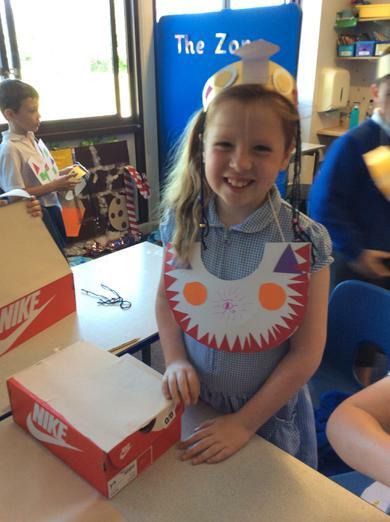 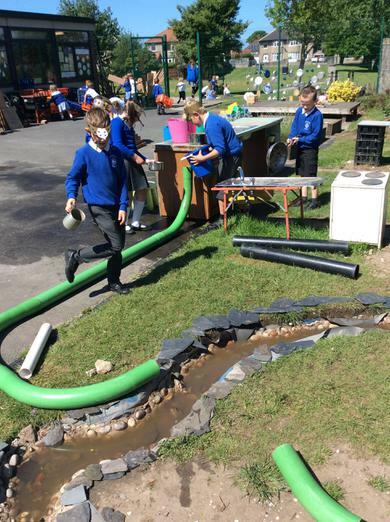 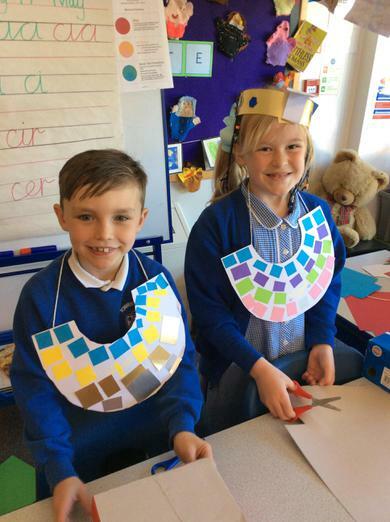 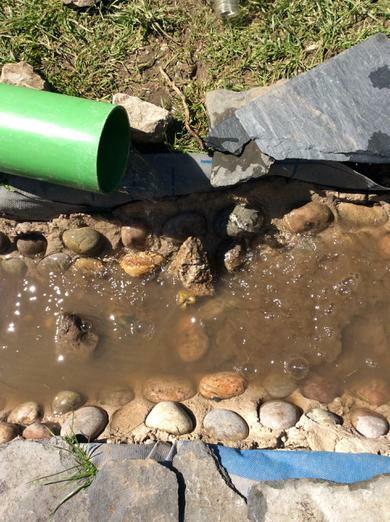 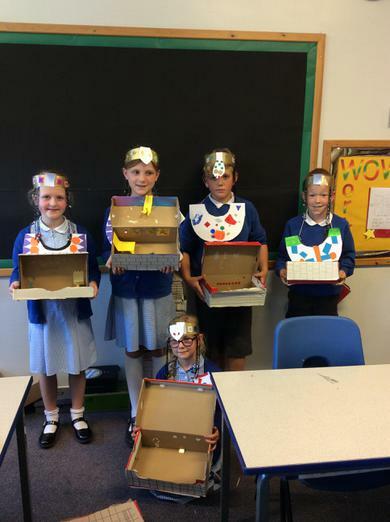 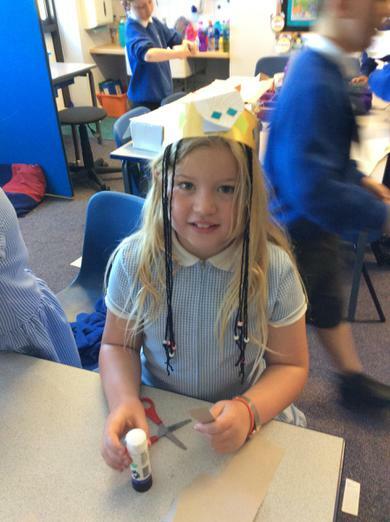 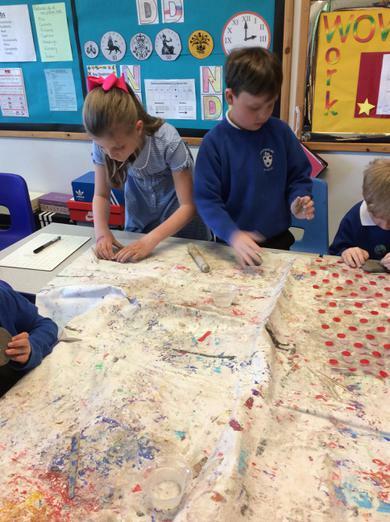 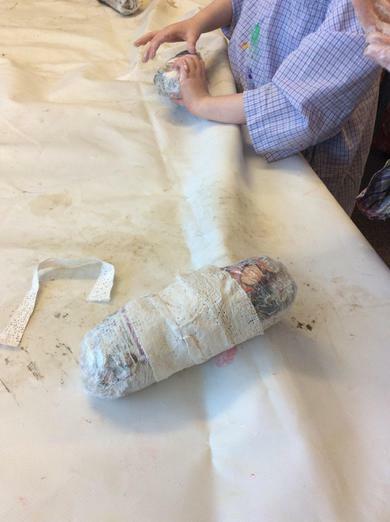 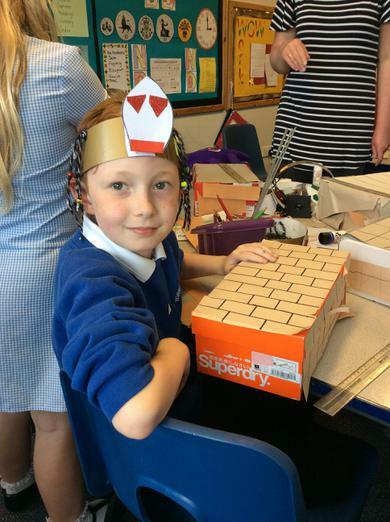 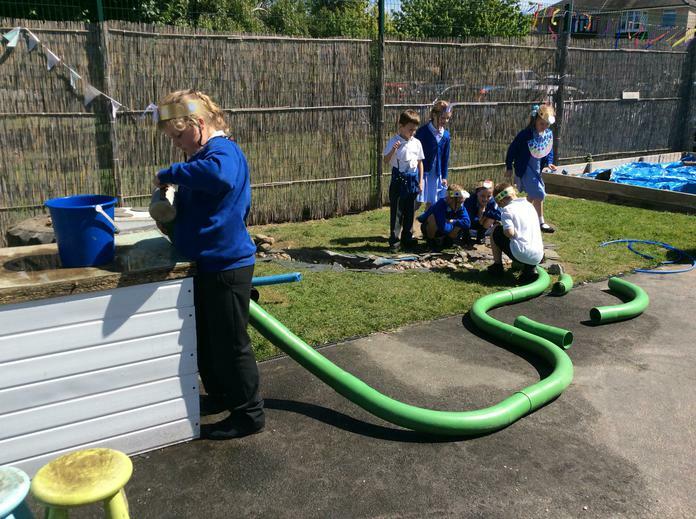 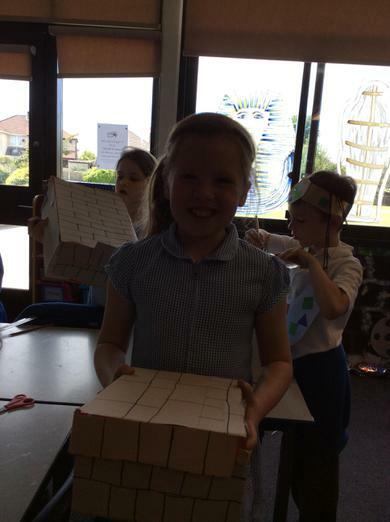 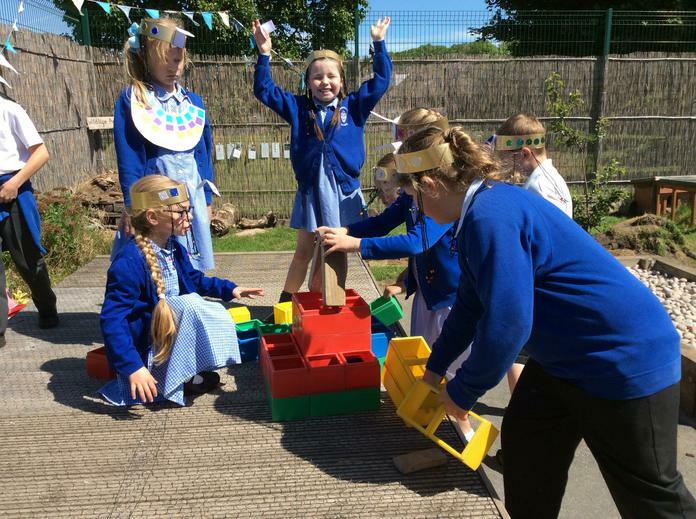 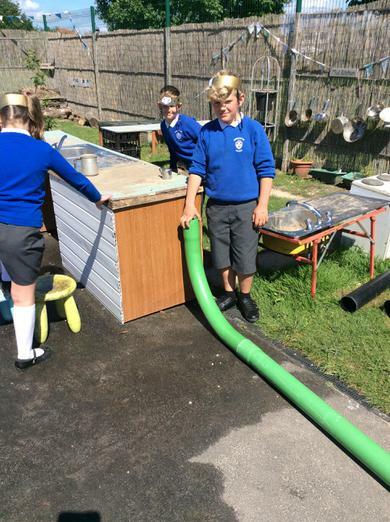 We enjoyed lots of art and craft, we made exquisite headdresses and collars, we built a pyramid and we even attempted to make the flow of the River Nile using water pipes! 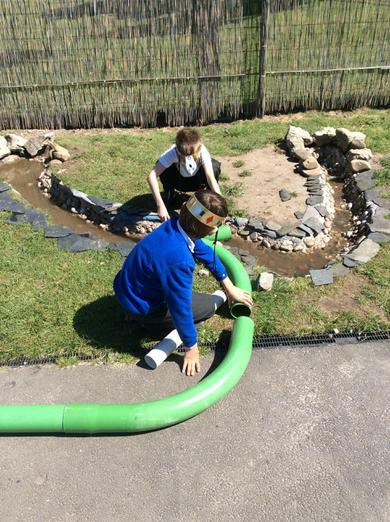 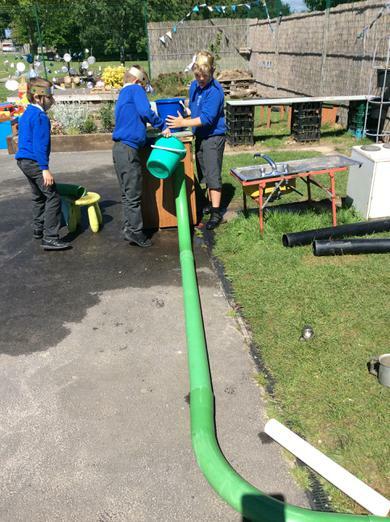 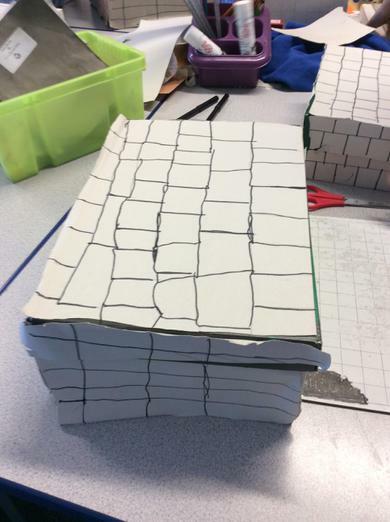 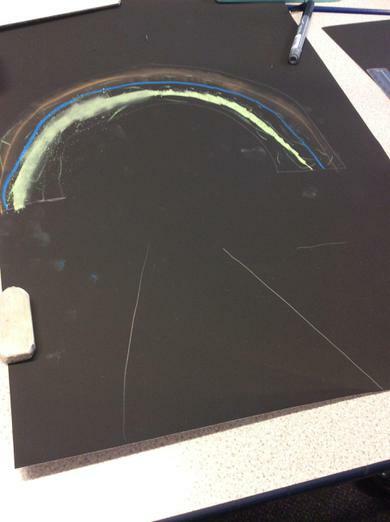 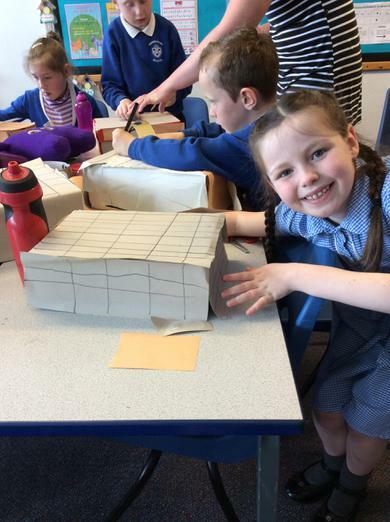 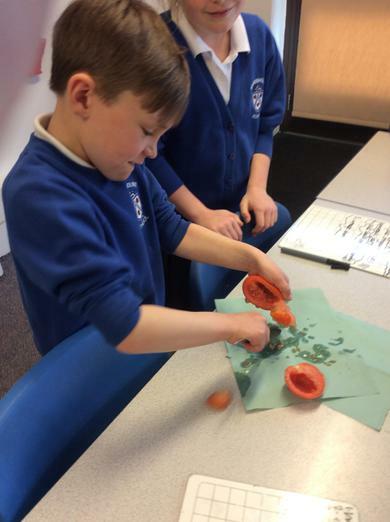 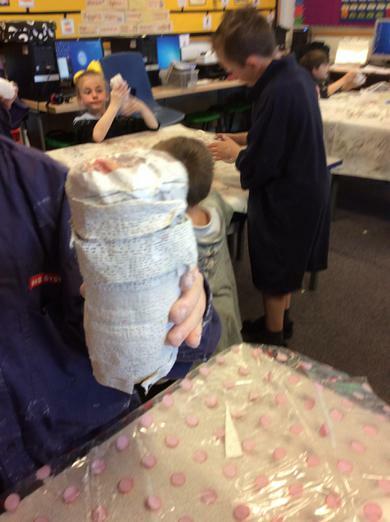 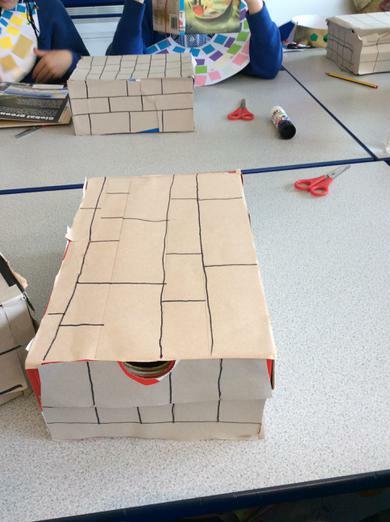 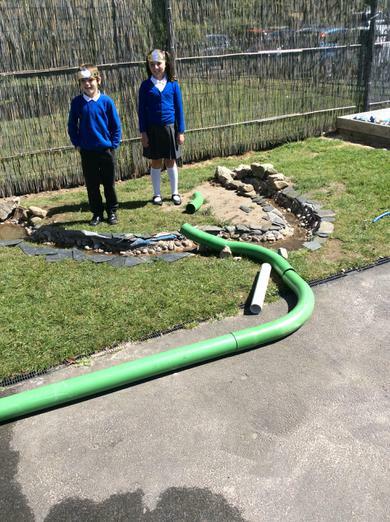 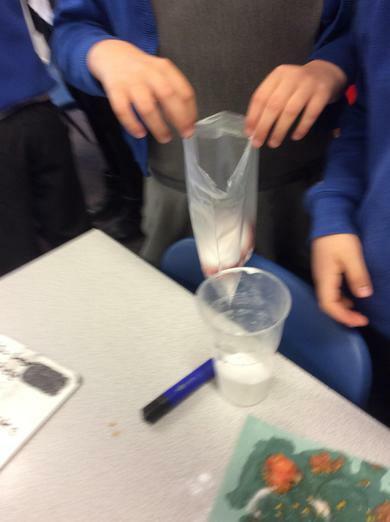 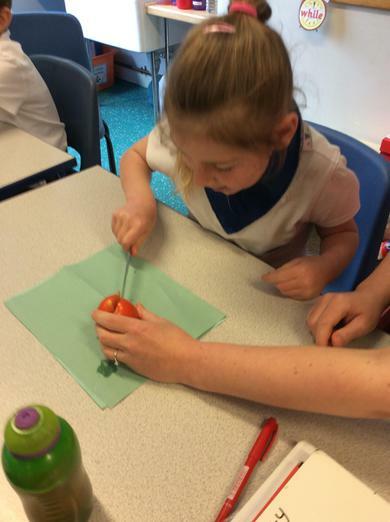 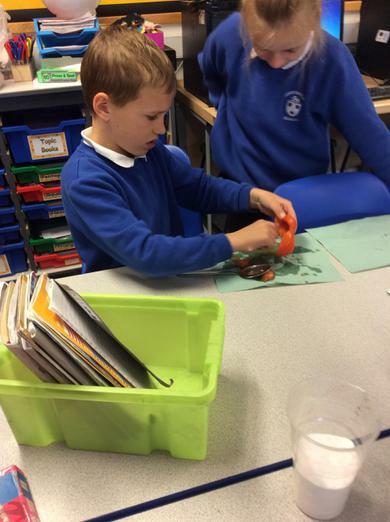 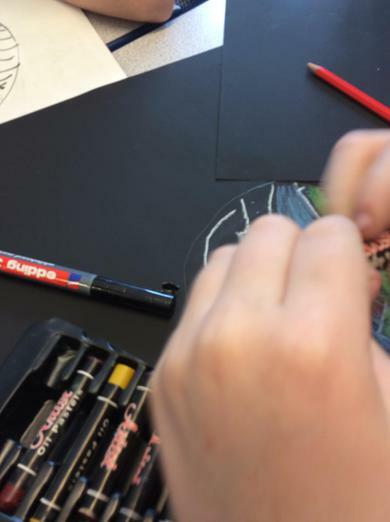 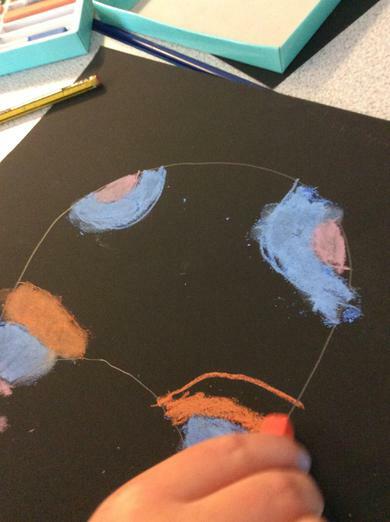 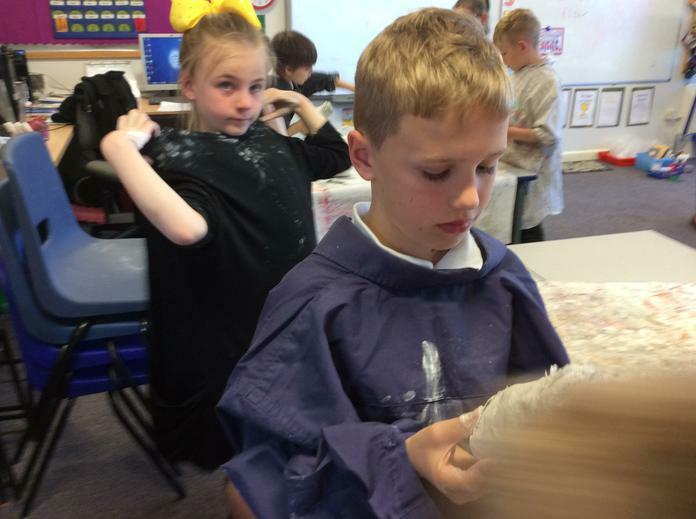 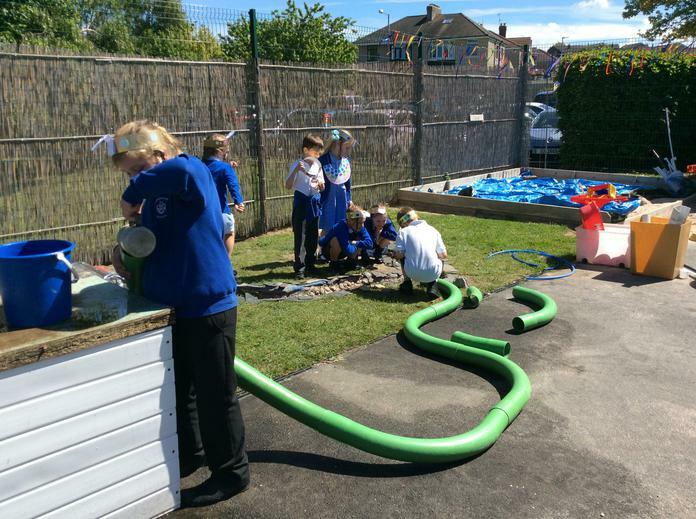 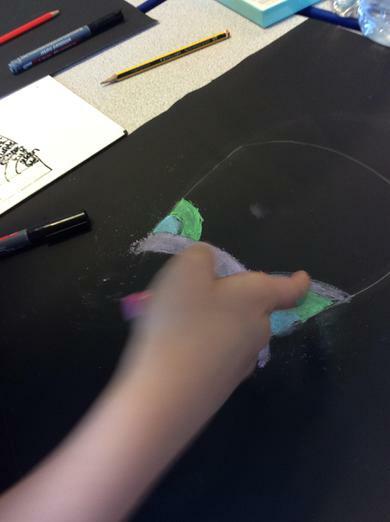 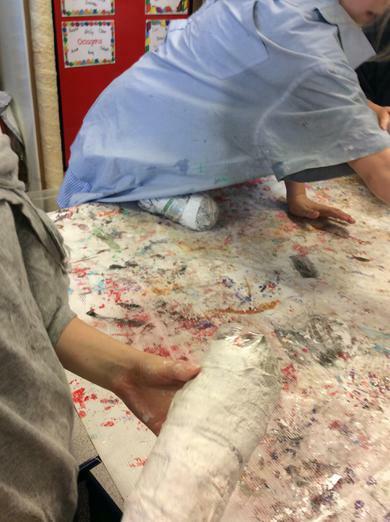 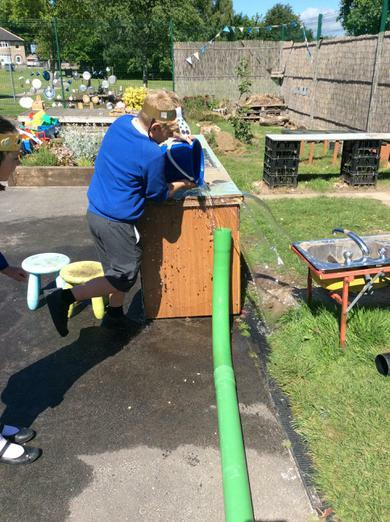 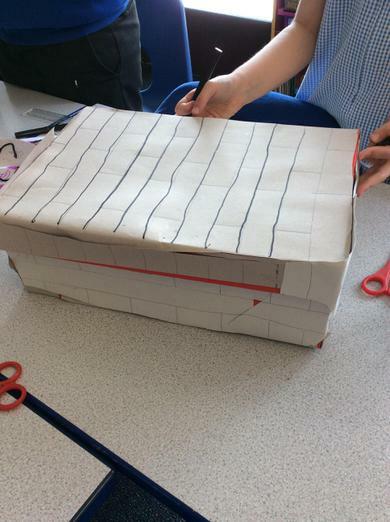 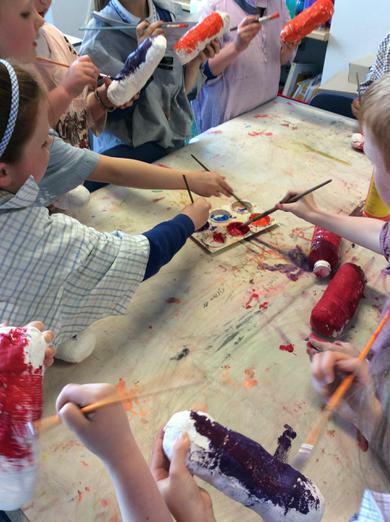 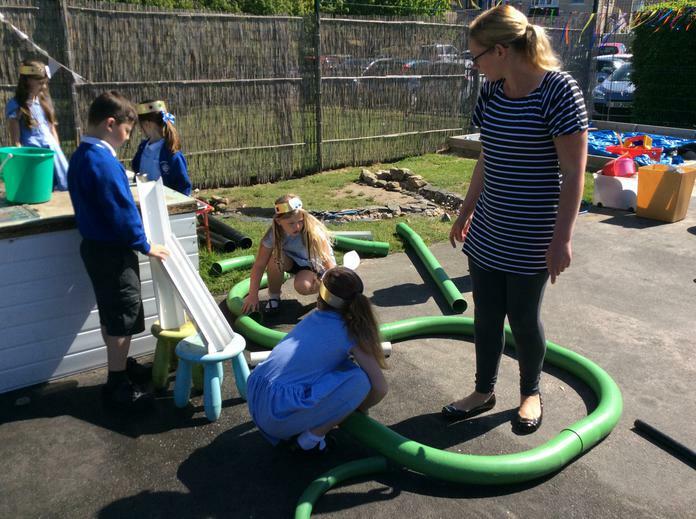 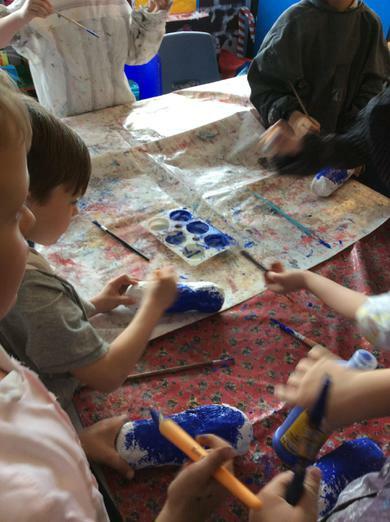 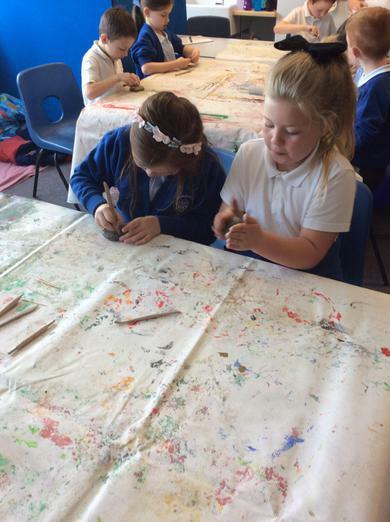 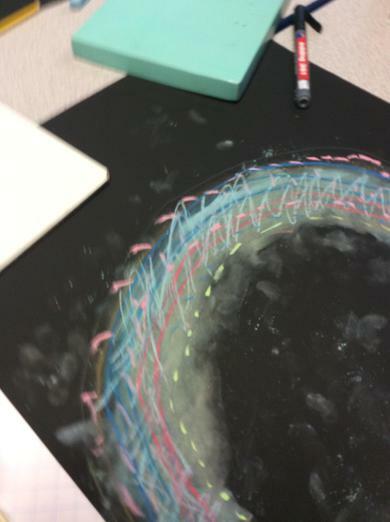 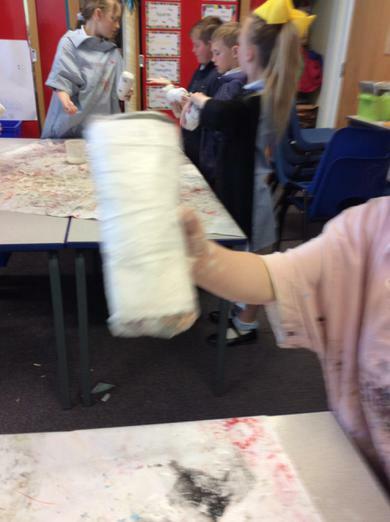 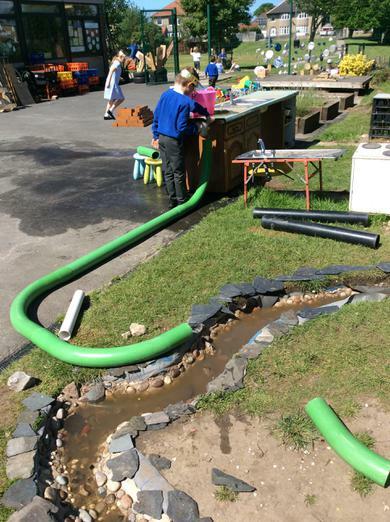 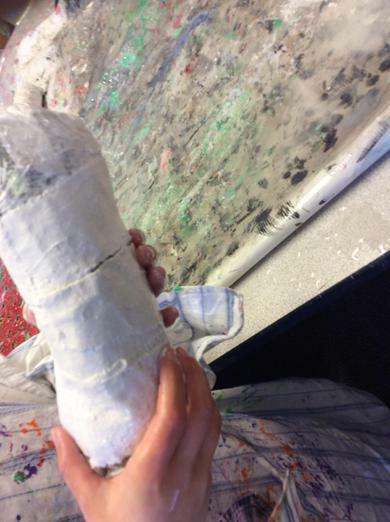 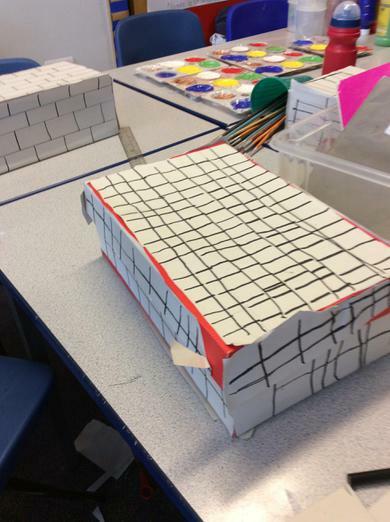 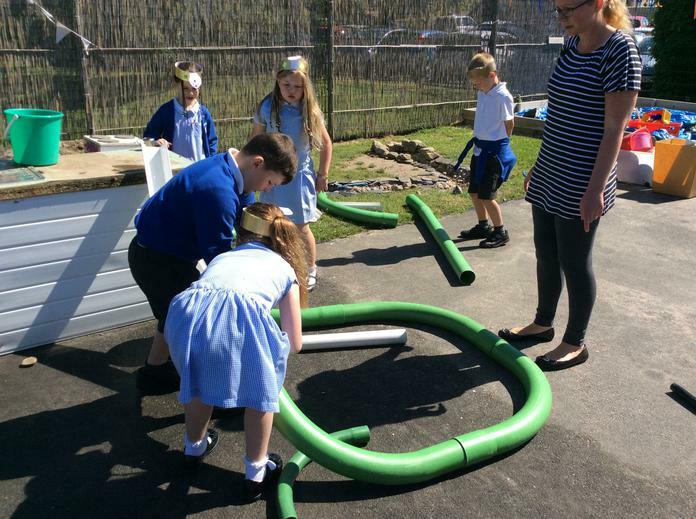 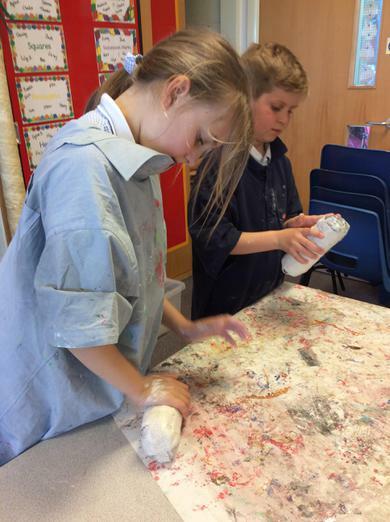 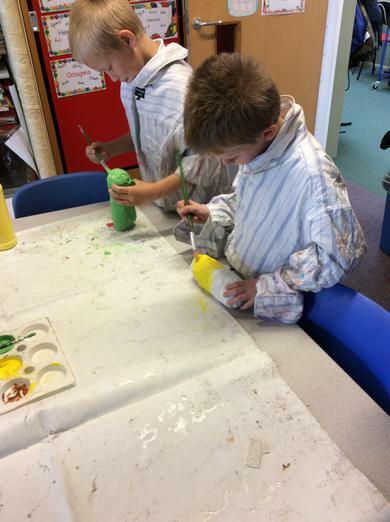 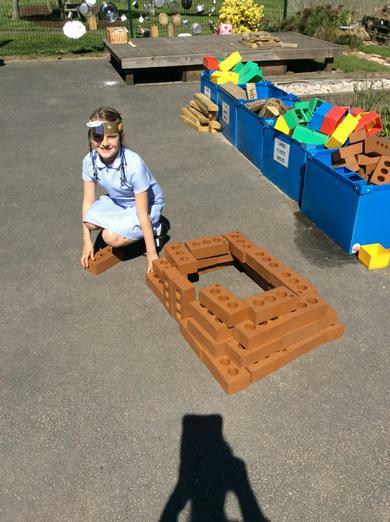 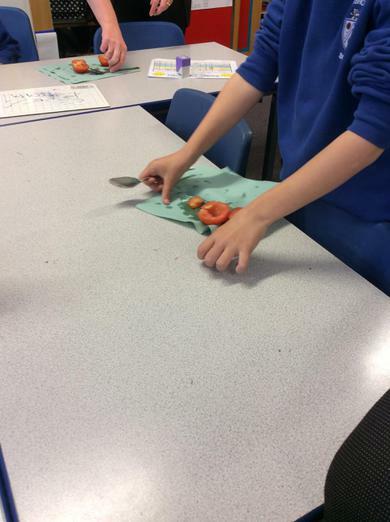 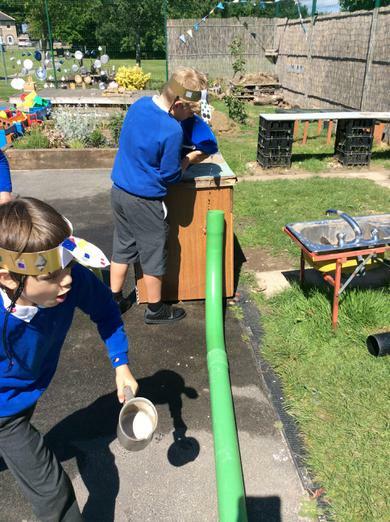 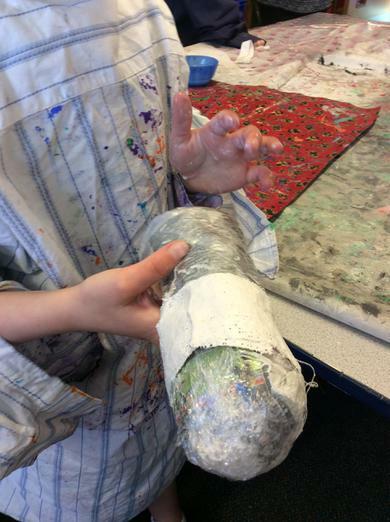 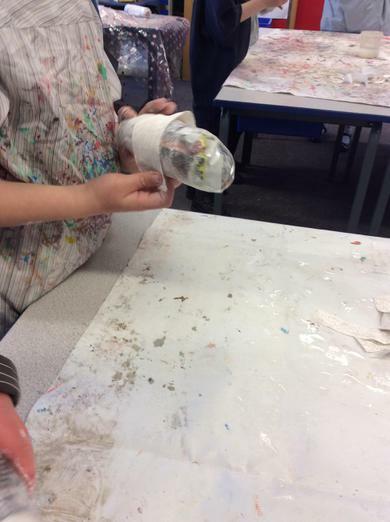 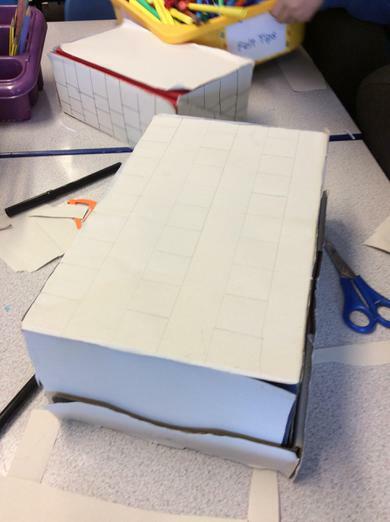 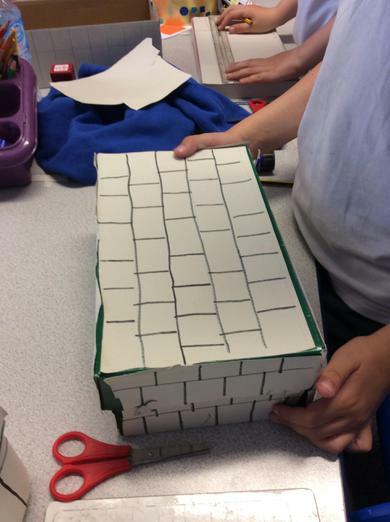 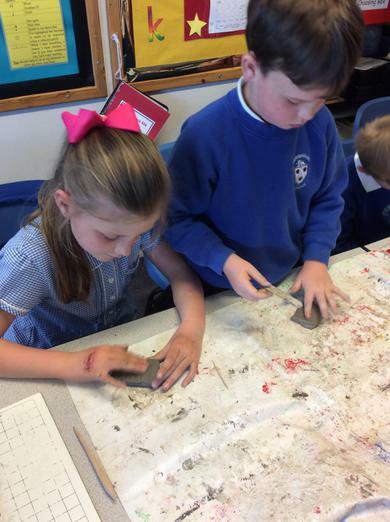 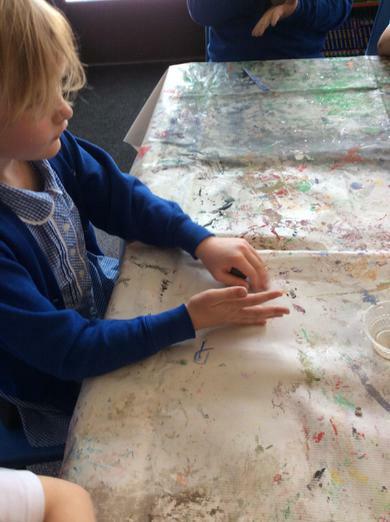 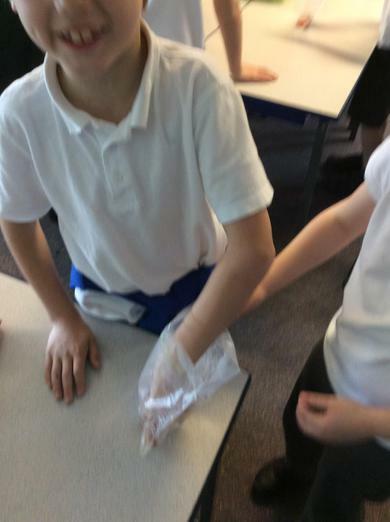 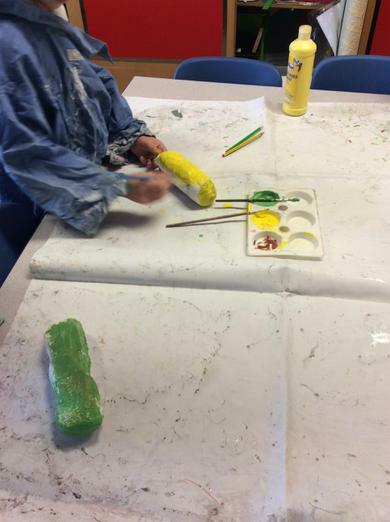 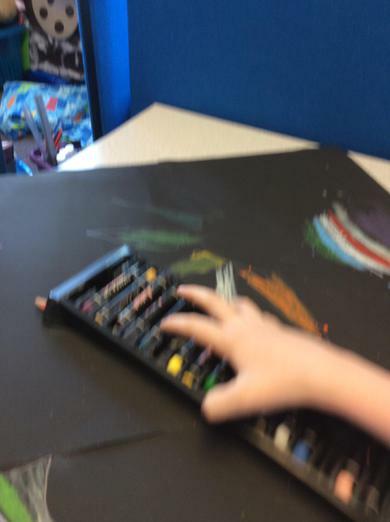 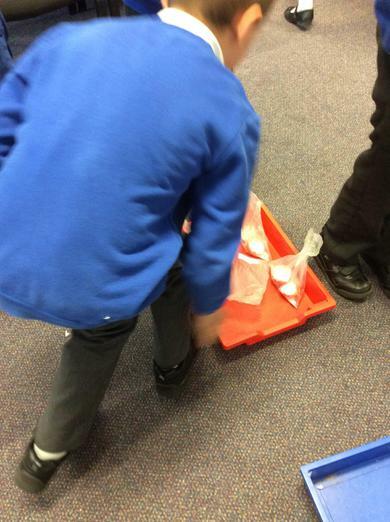 We've had such an exciting half term with lots of activities and skills being developed! 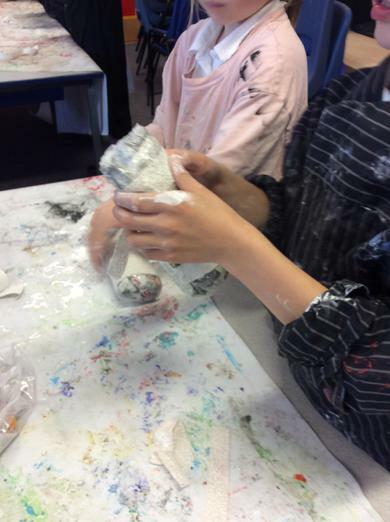 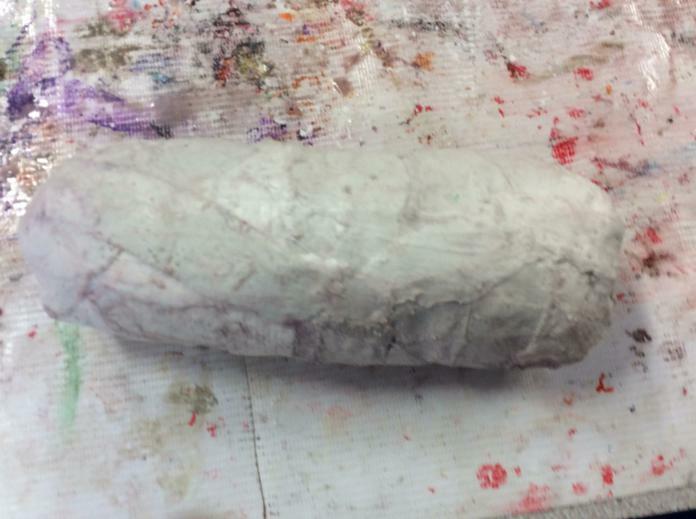 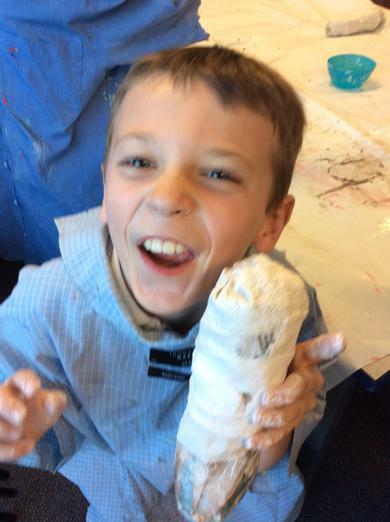 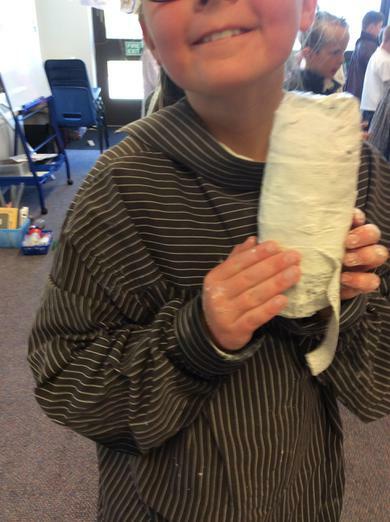 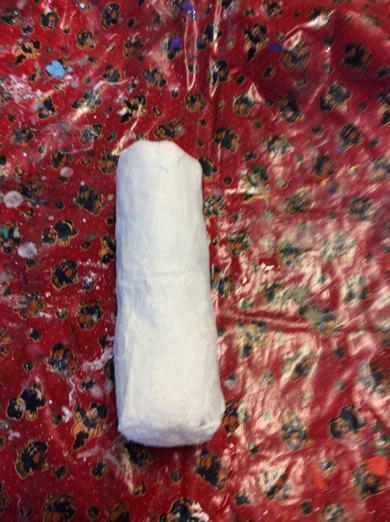 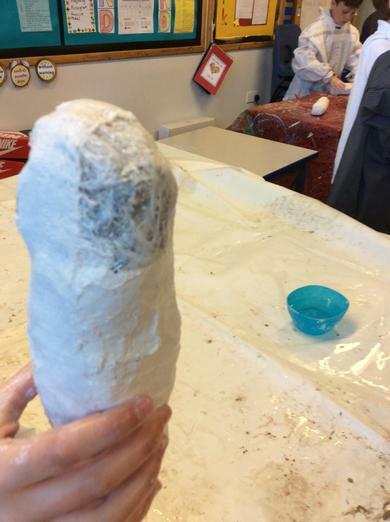 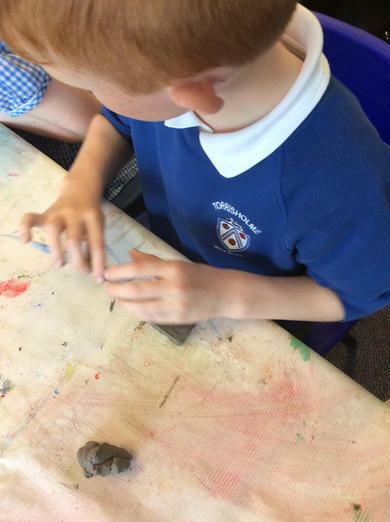 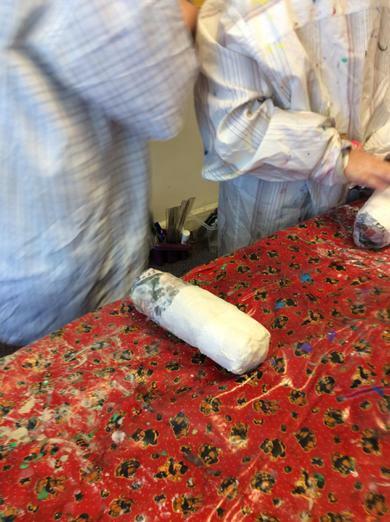 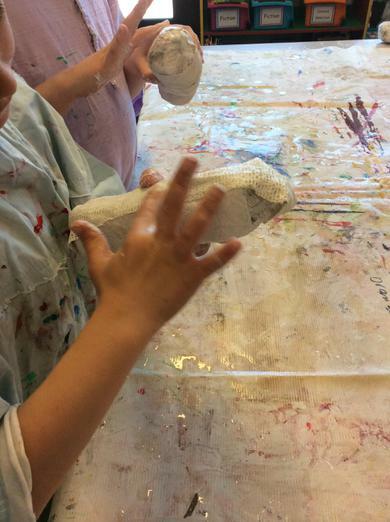 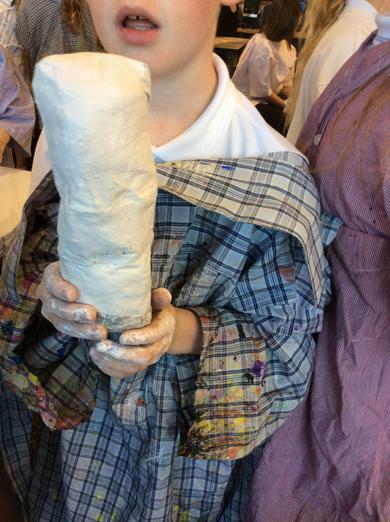 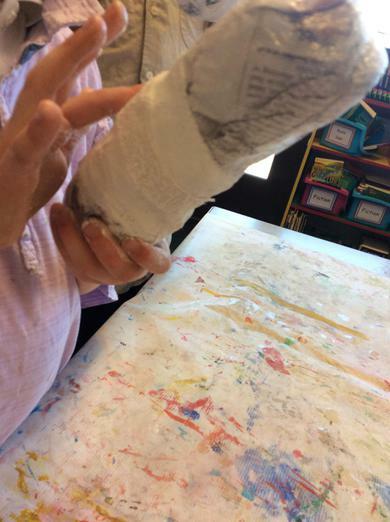 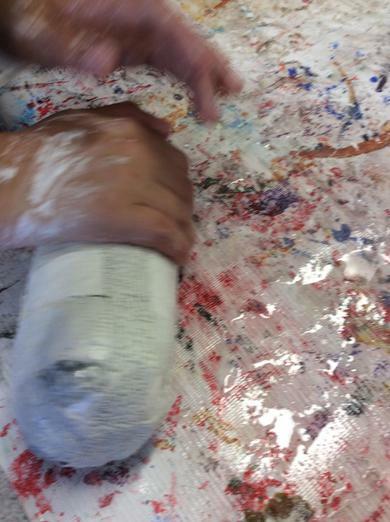 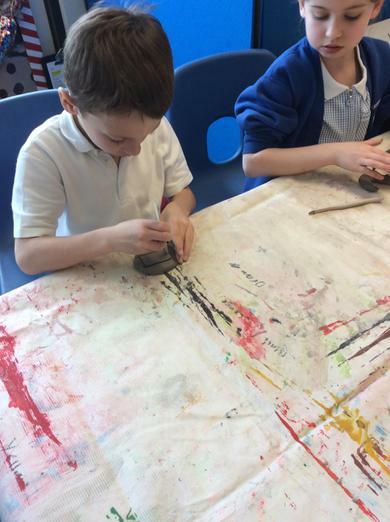 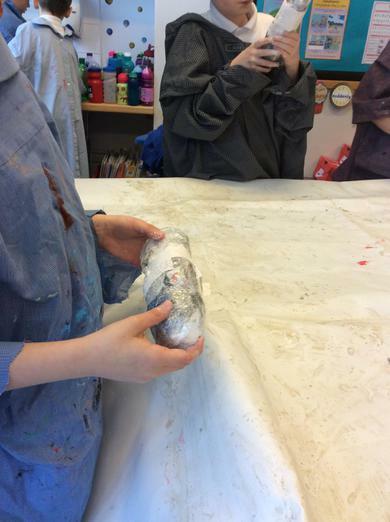 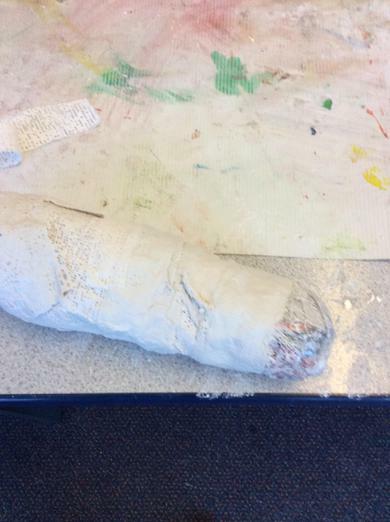 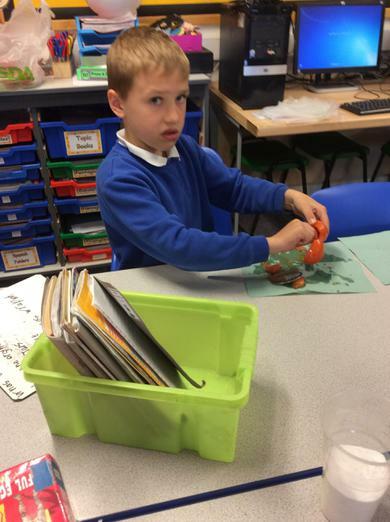 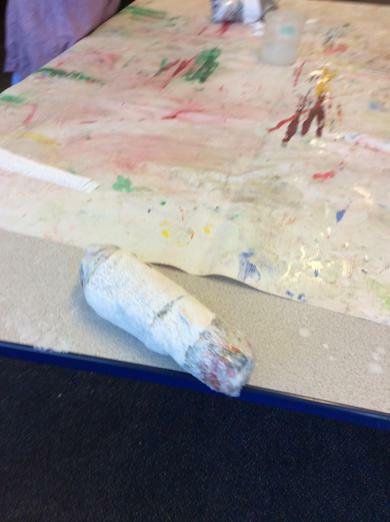 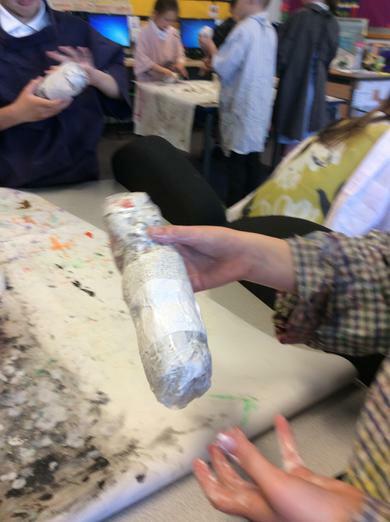 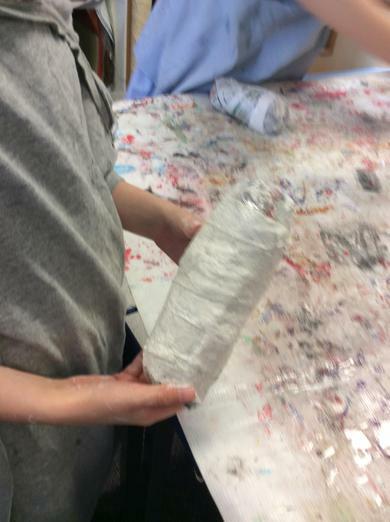 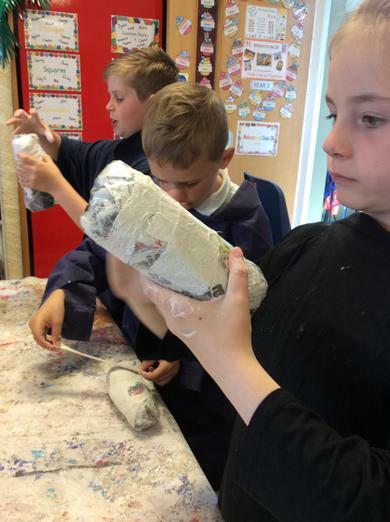 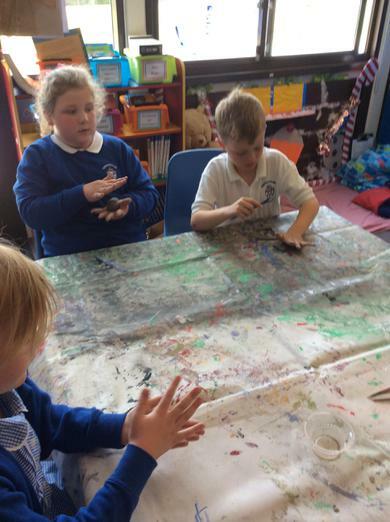 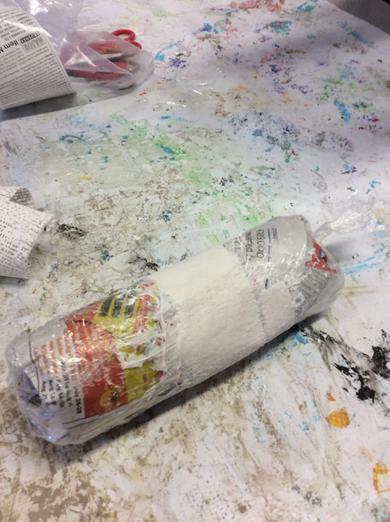 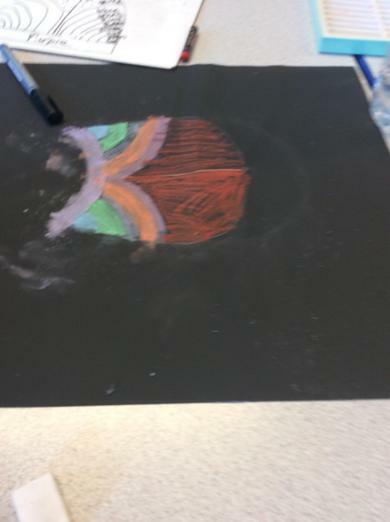 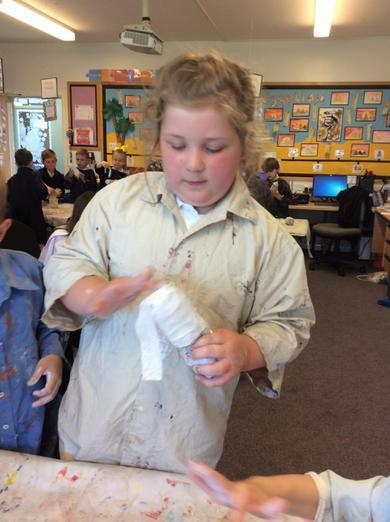 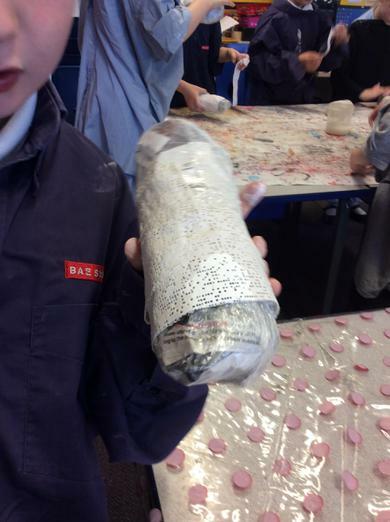 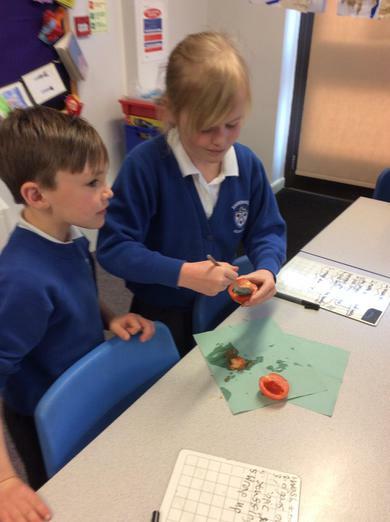 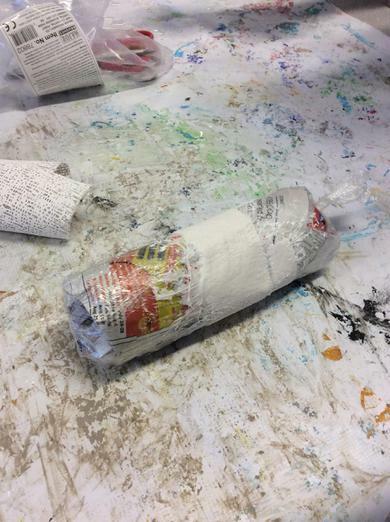 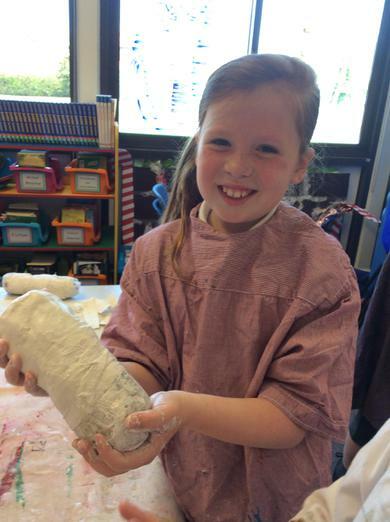 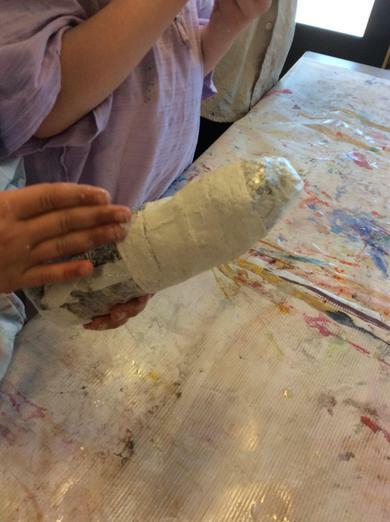 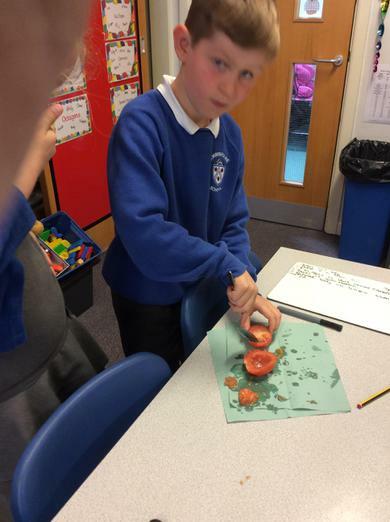 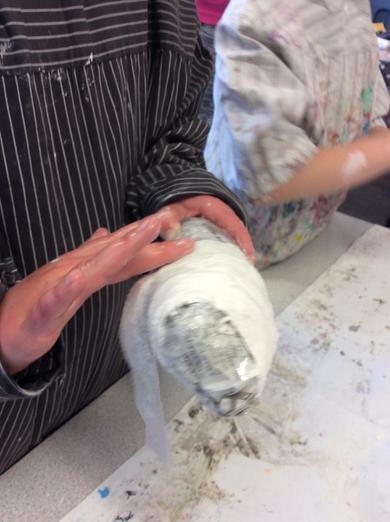 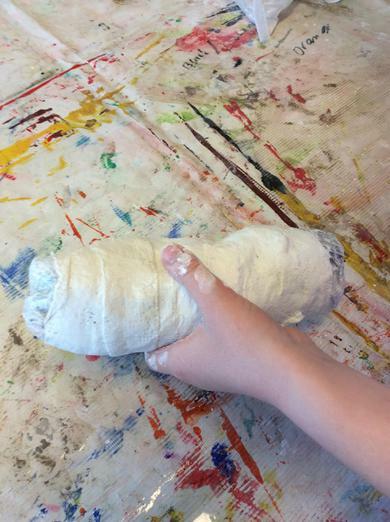 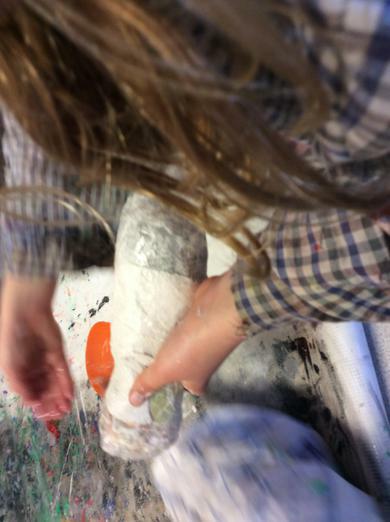 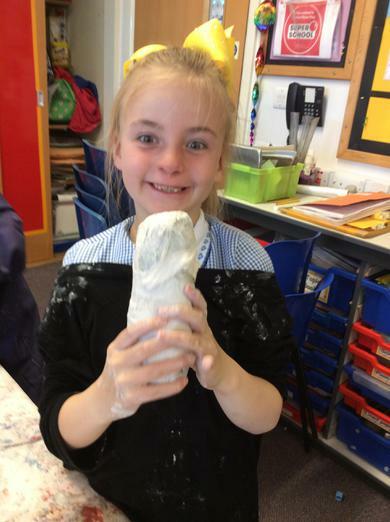 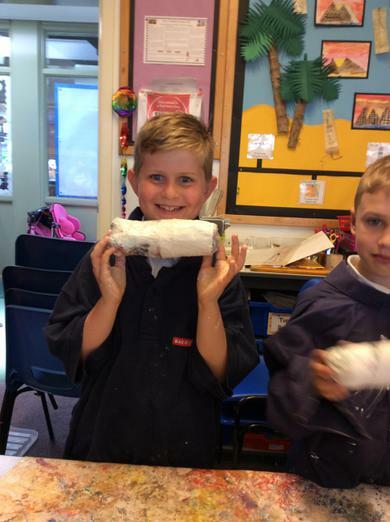 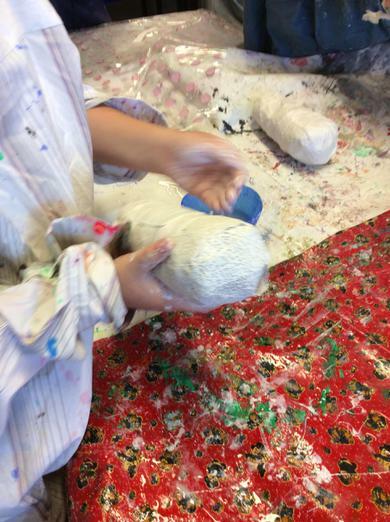 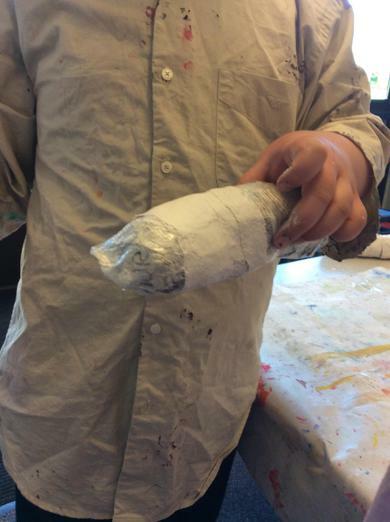 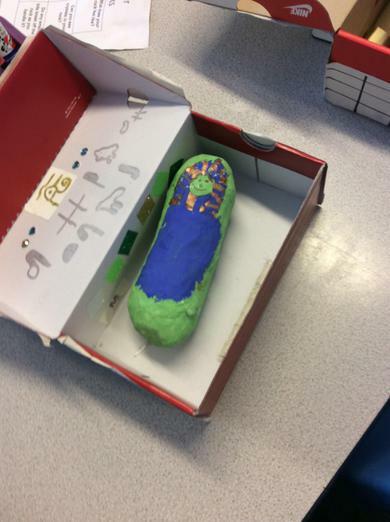 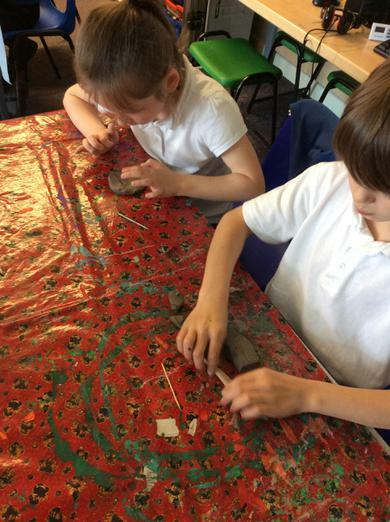 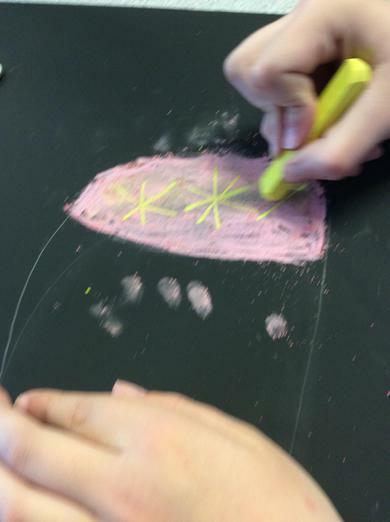 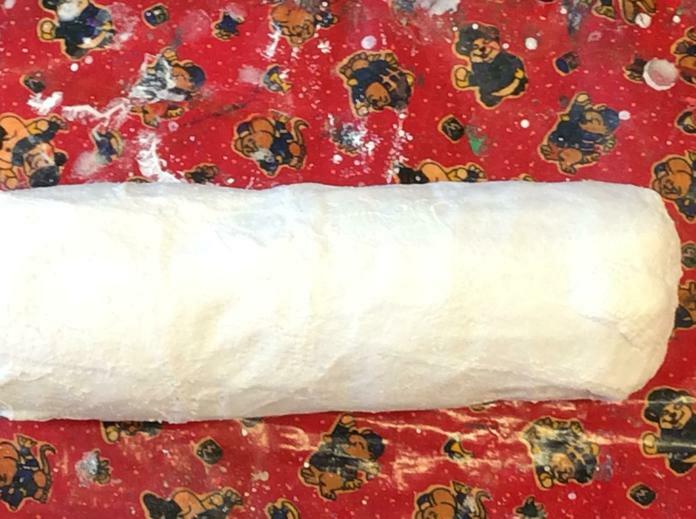 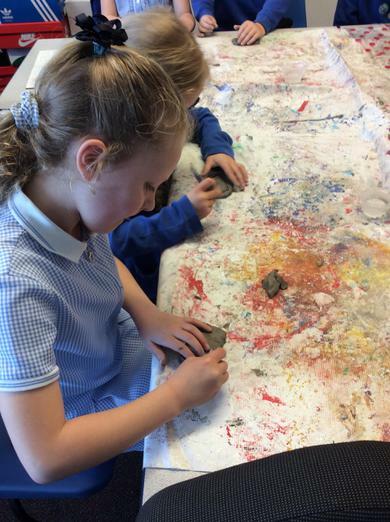 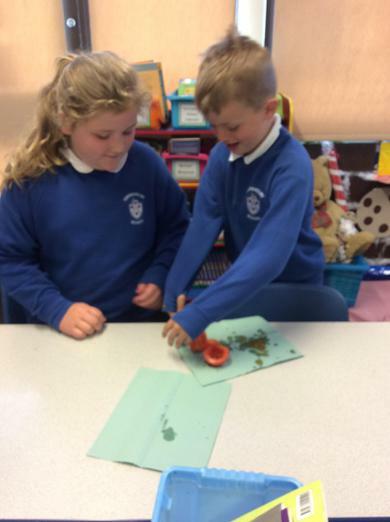 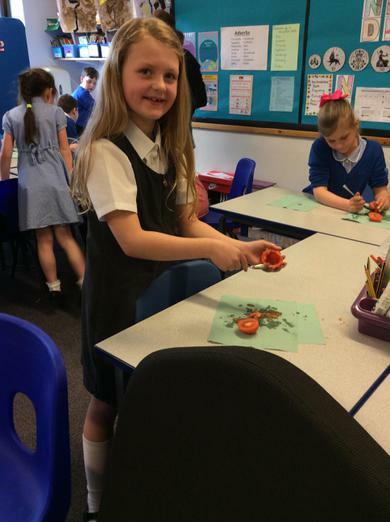 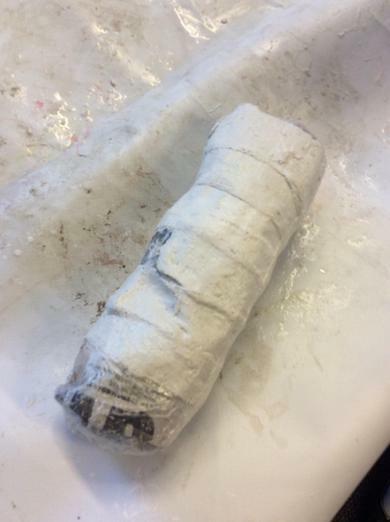 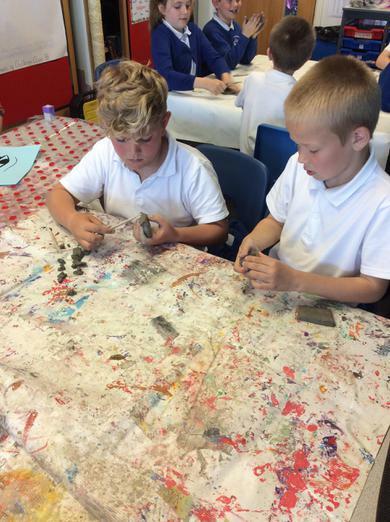 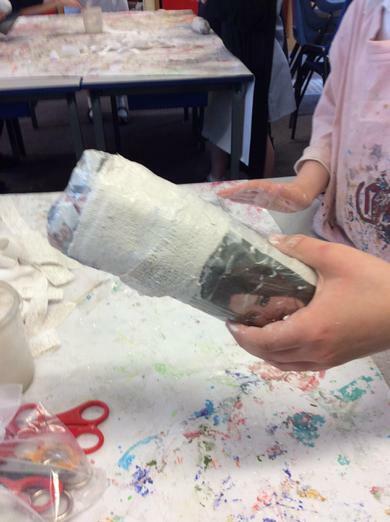 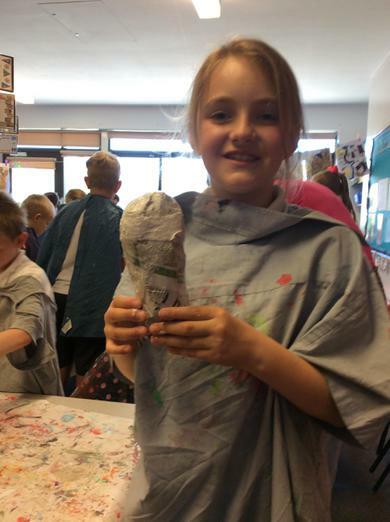 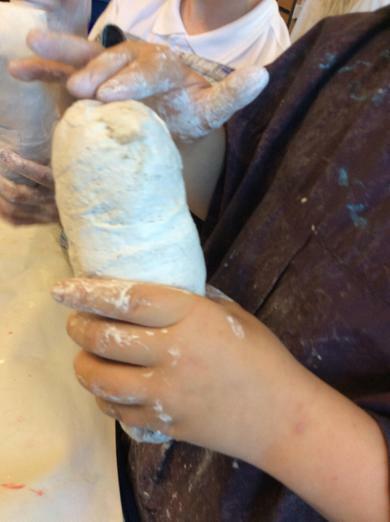 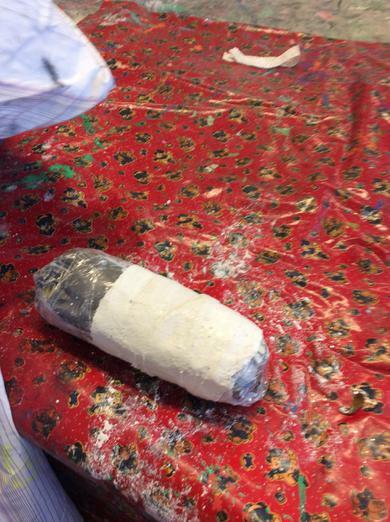 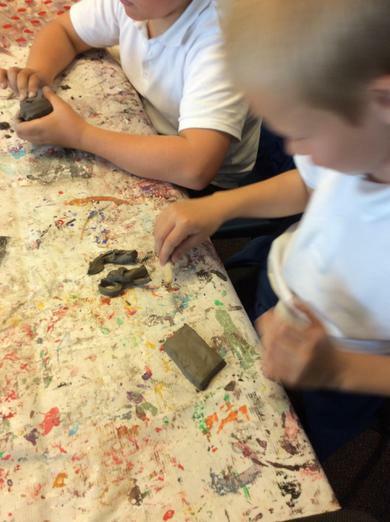 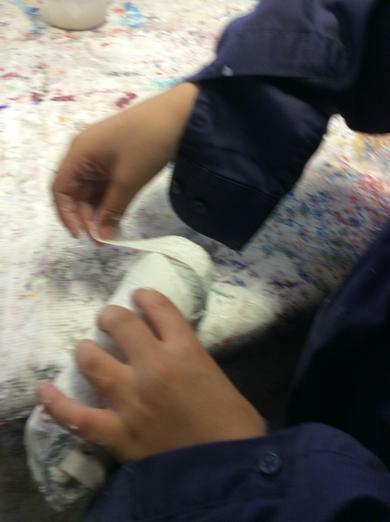 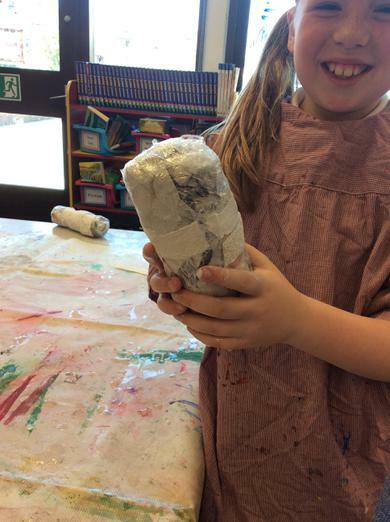 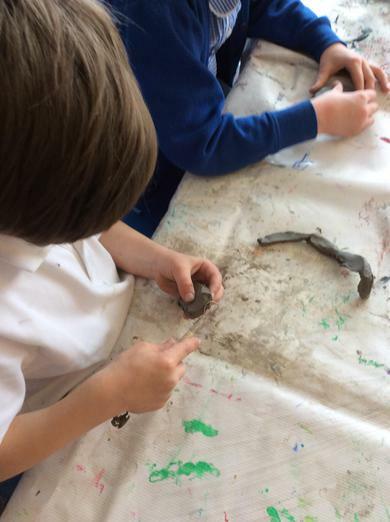 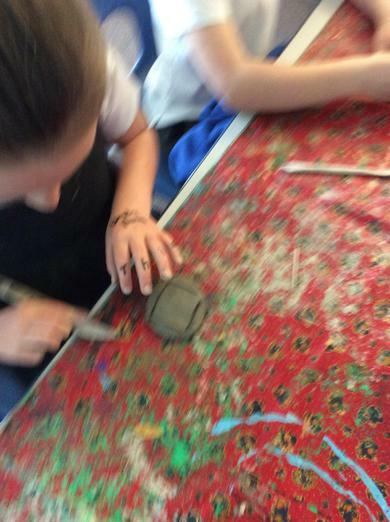 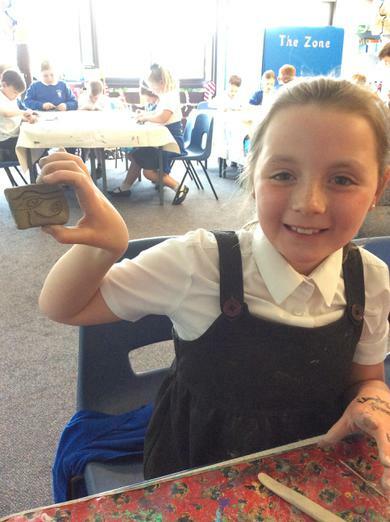 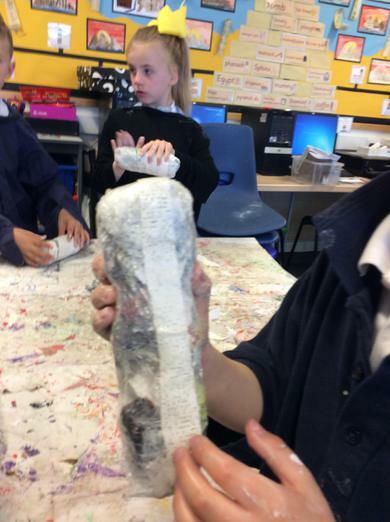 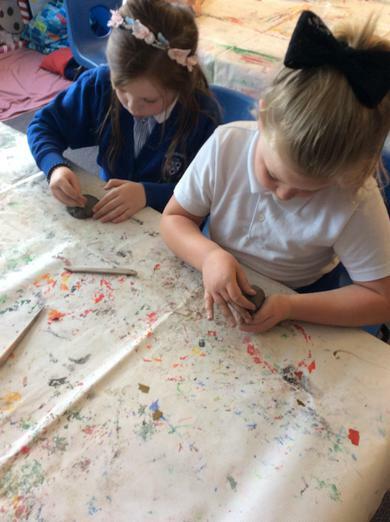 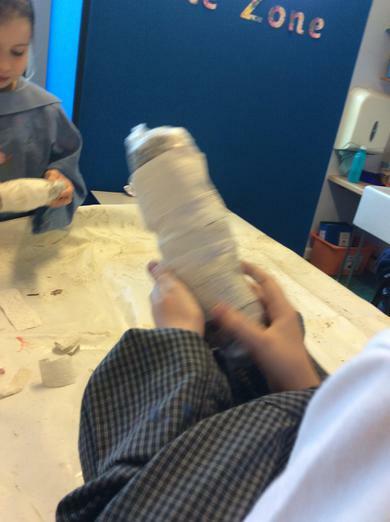 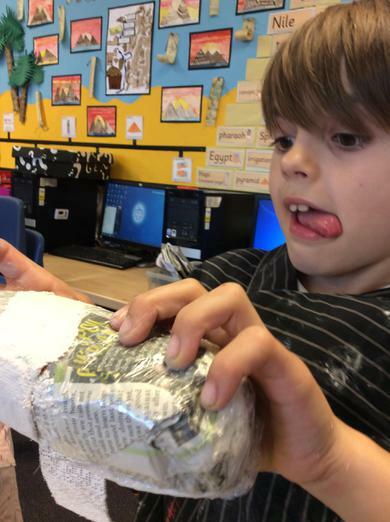 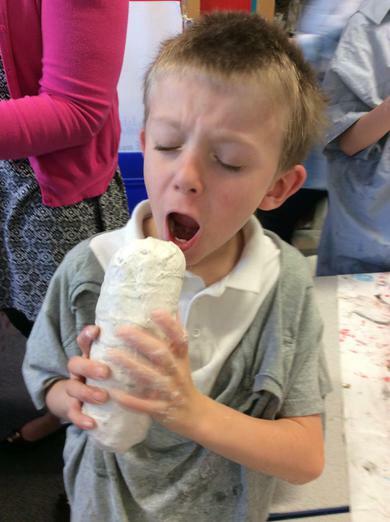 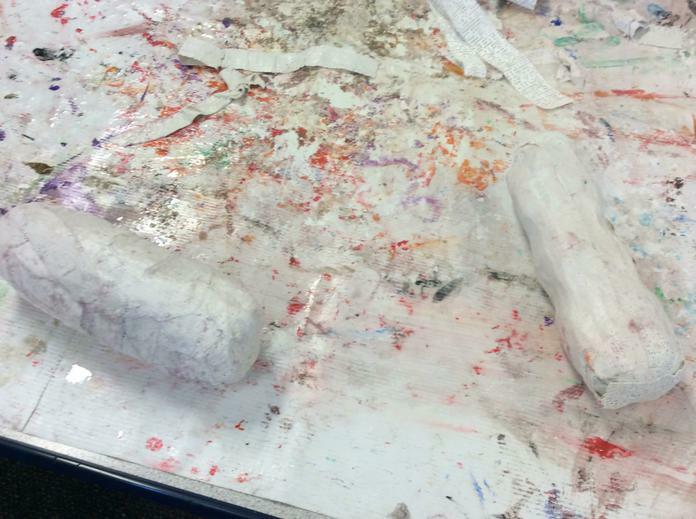 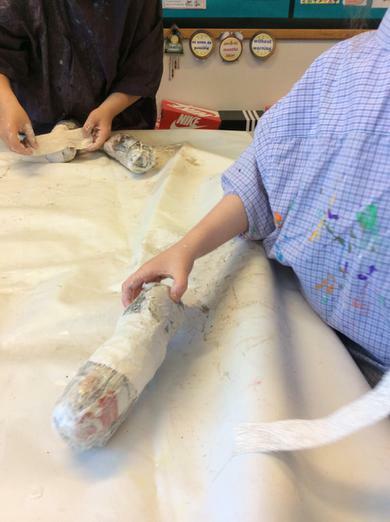 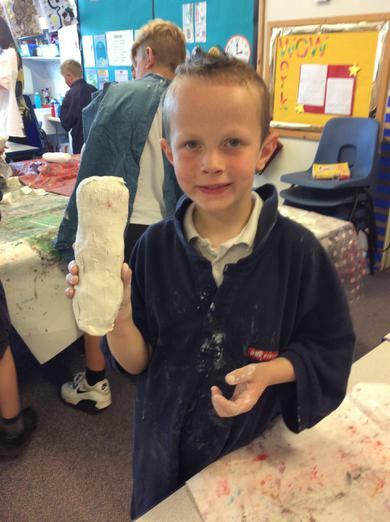 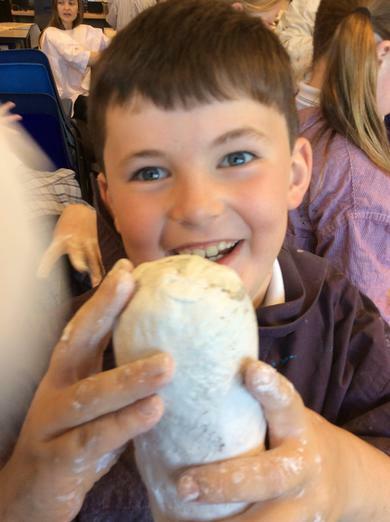 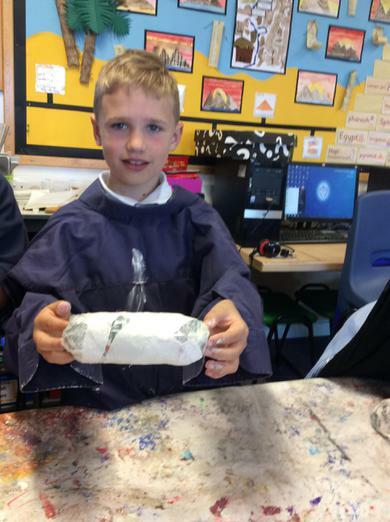 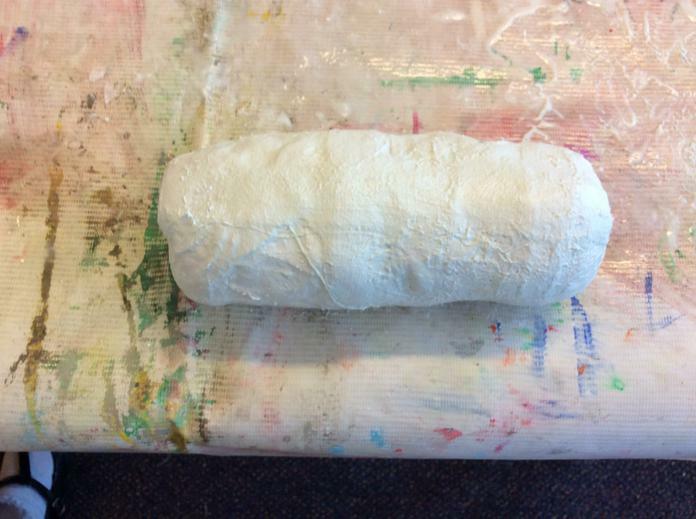 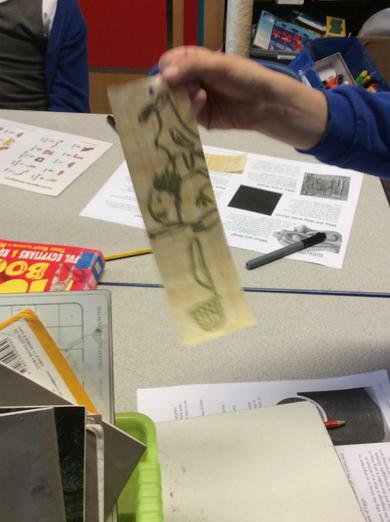 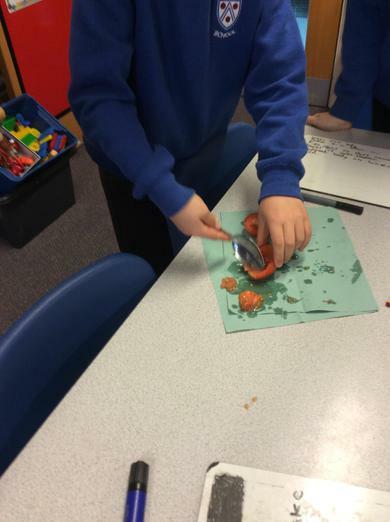 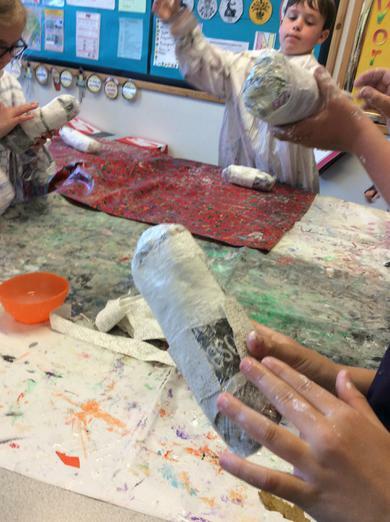 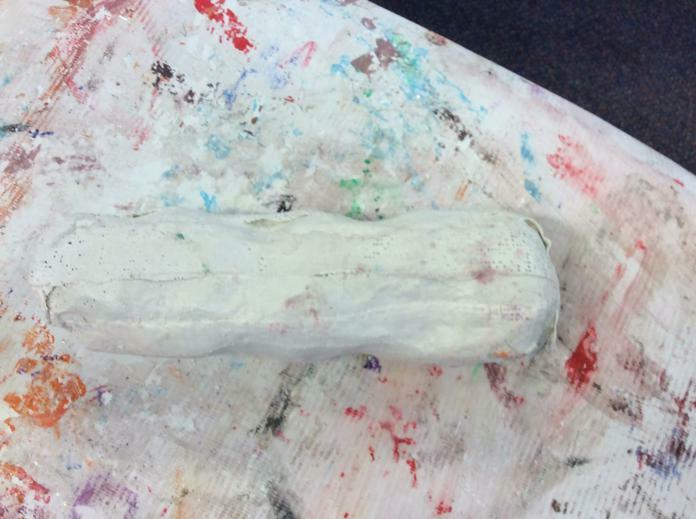 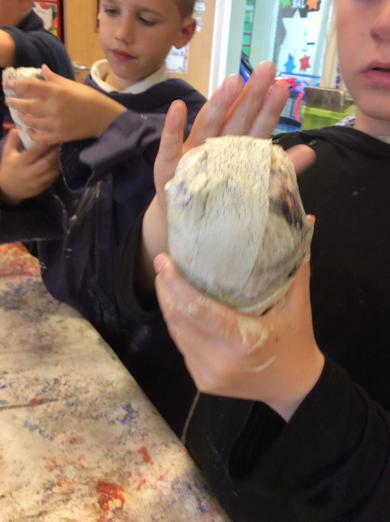 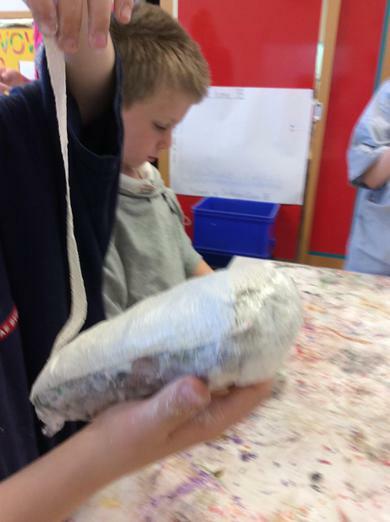 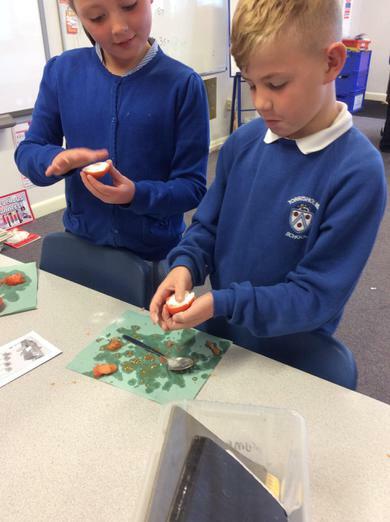 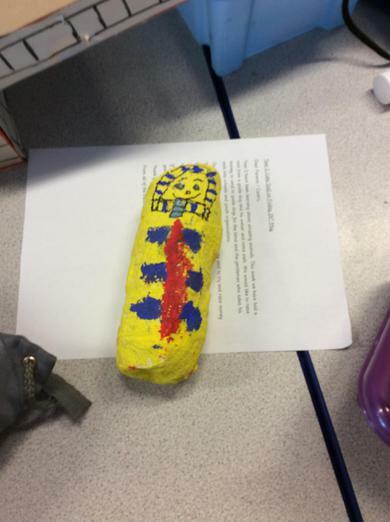 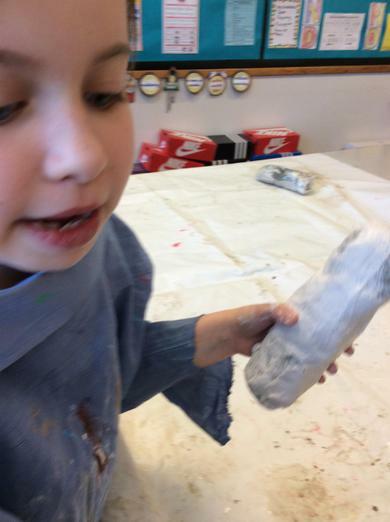 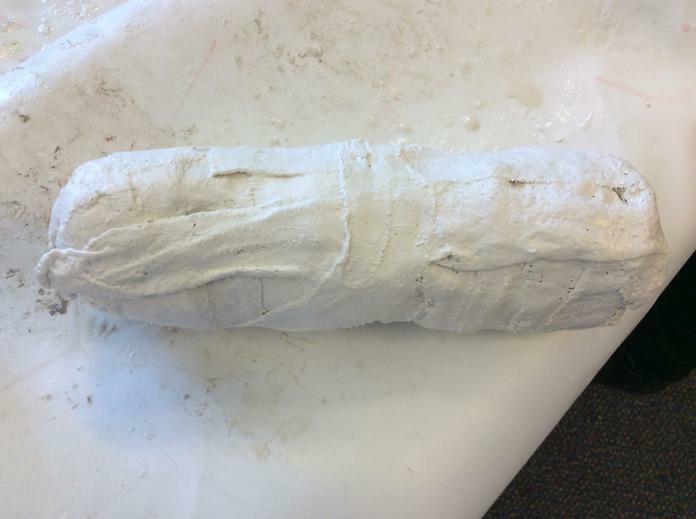 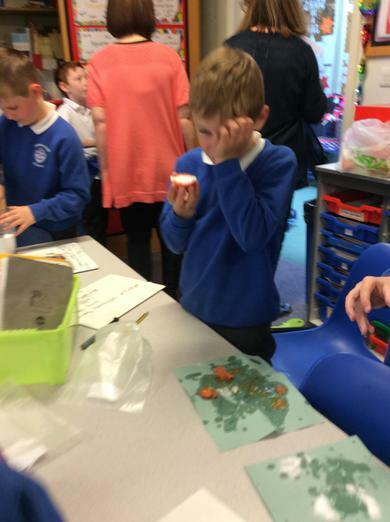 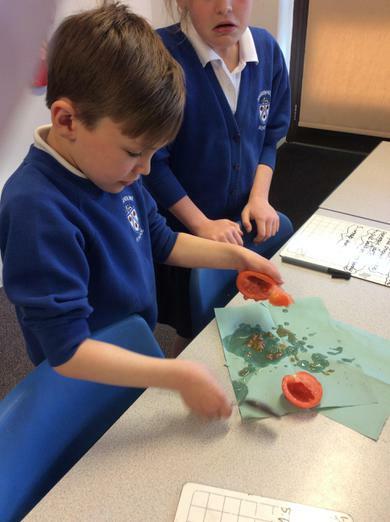 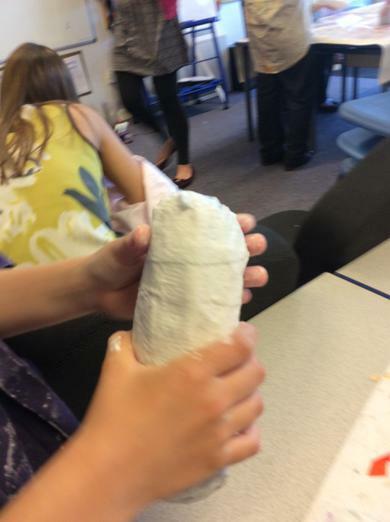 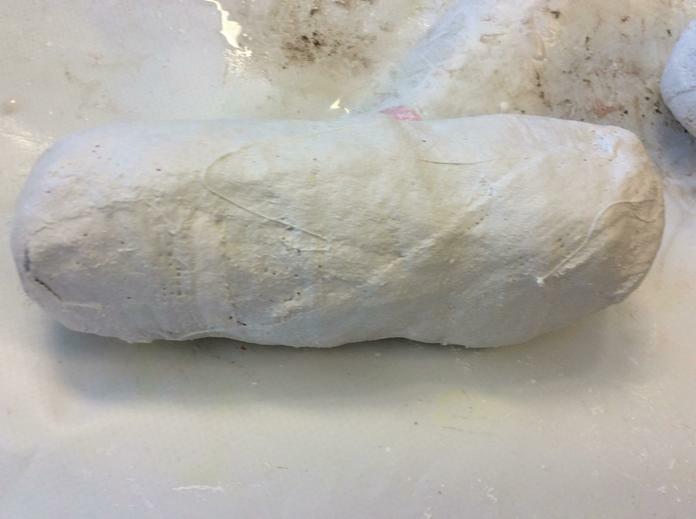 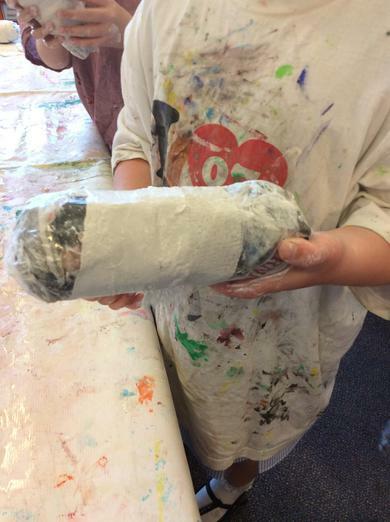 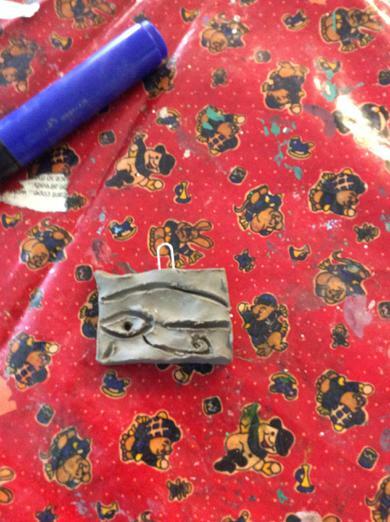 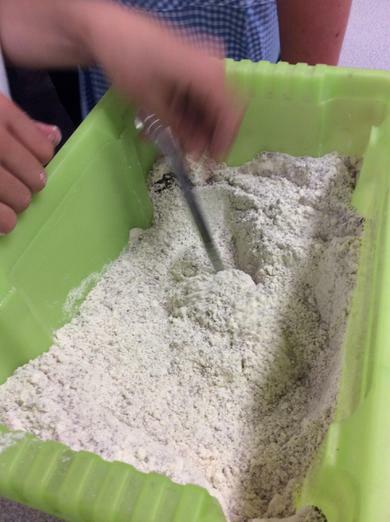 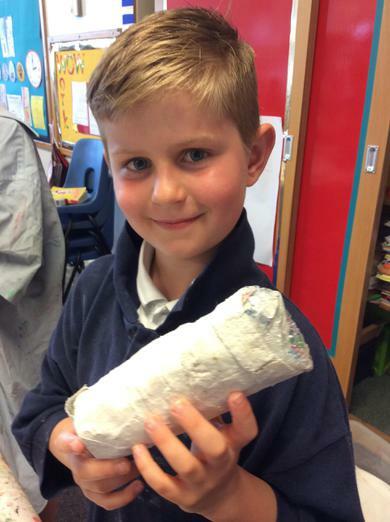 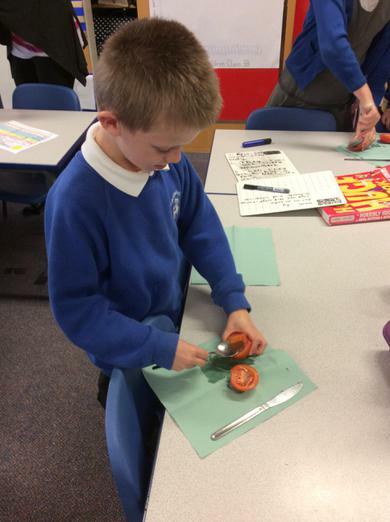 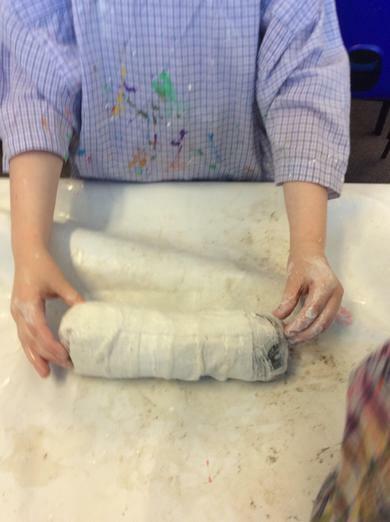 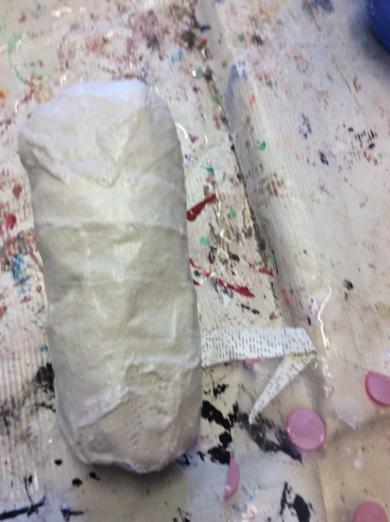 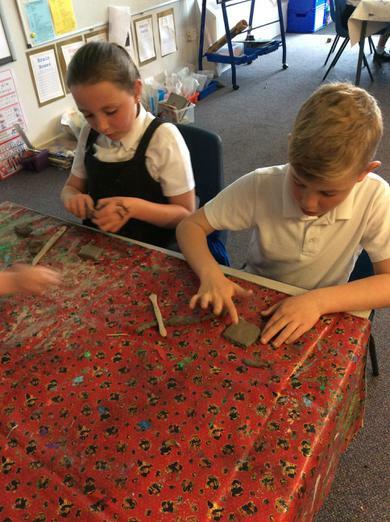 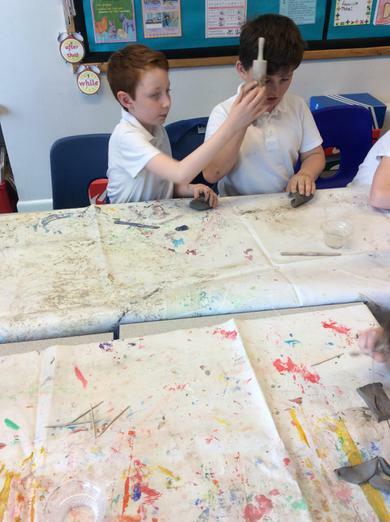 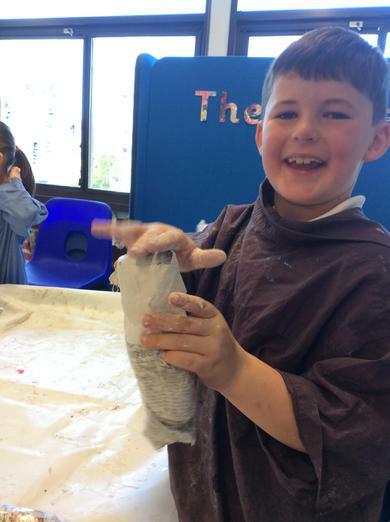 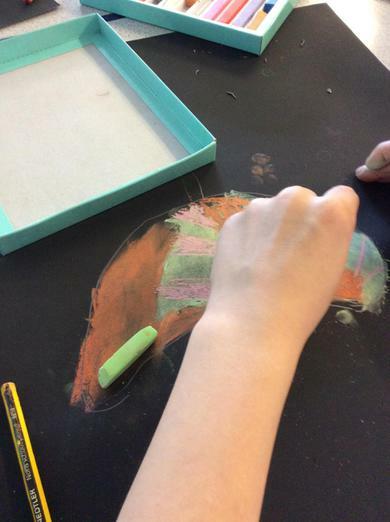 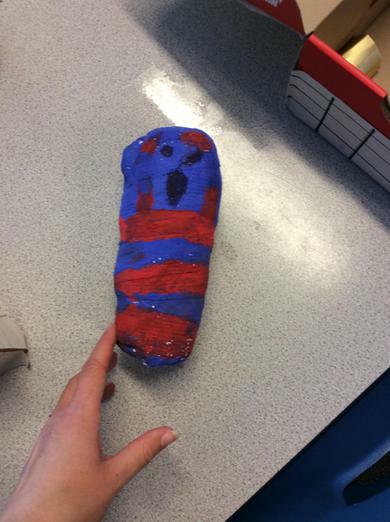 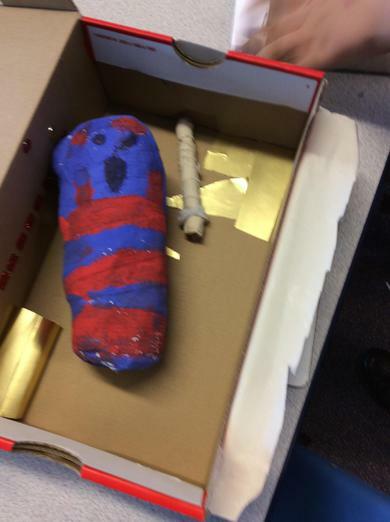 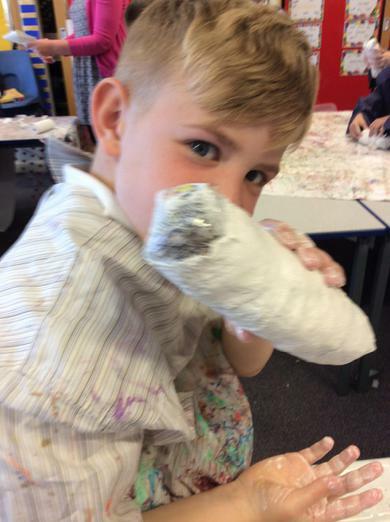 We used clay to make an amulet of the eye of Horus! 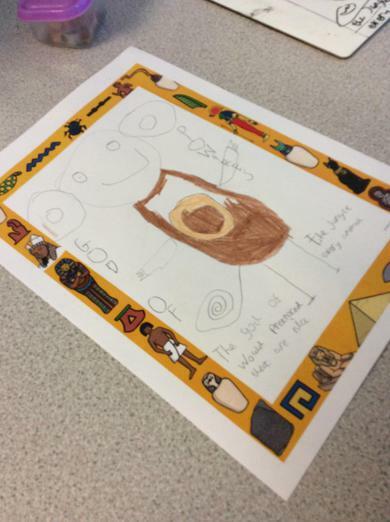 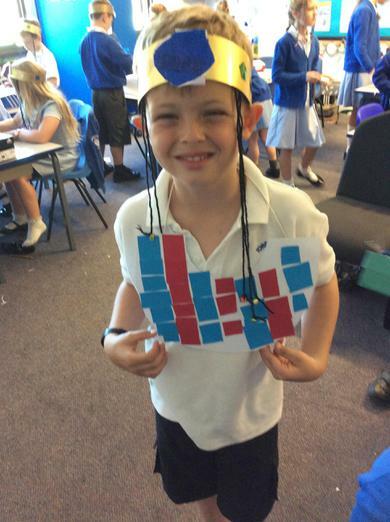 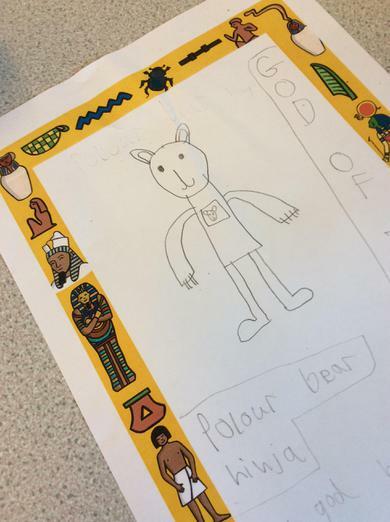 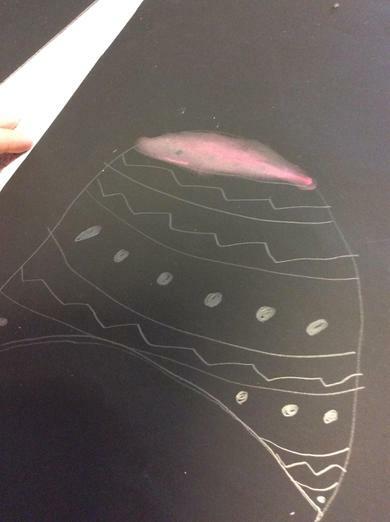 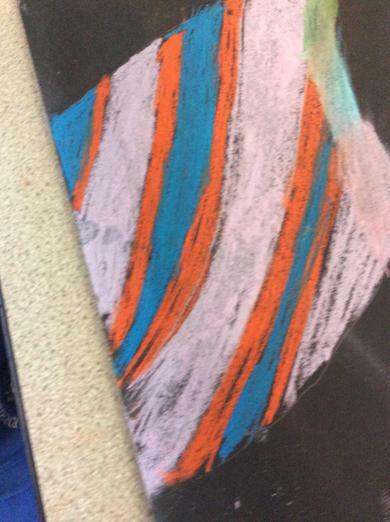 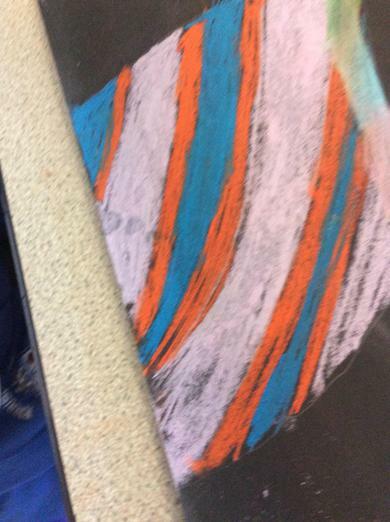 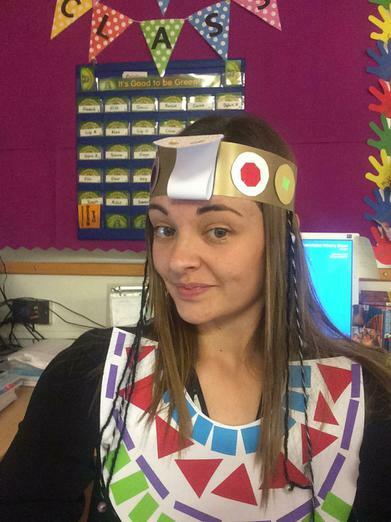 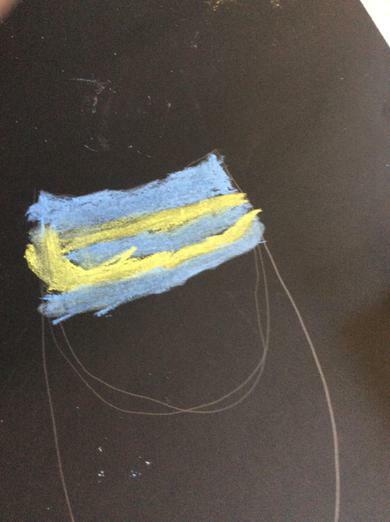 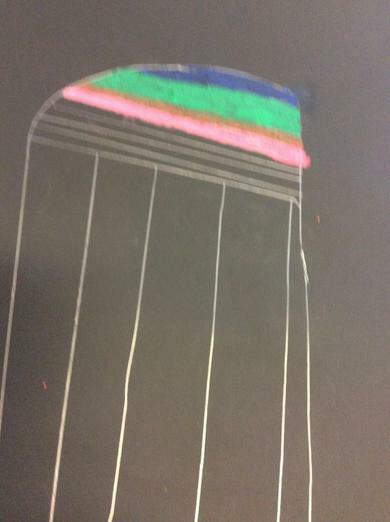 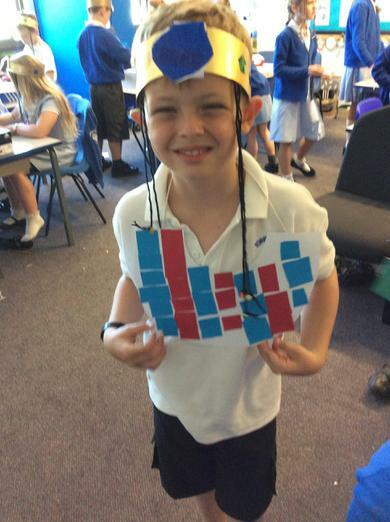 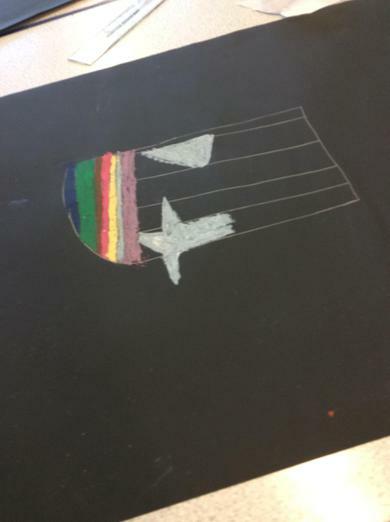 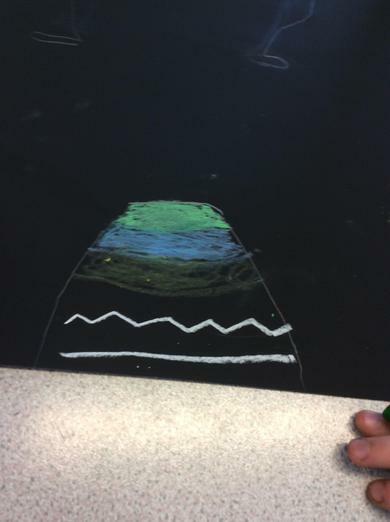 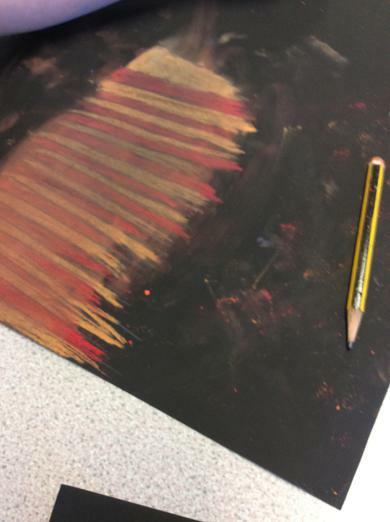 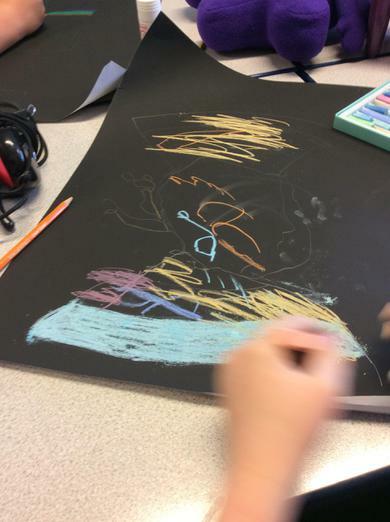 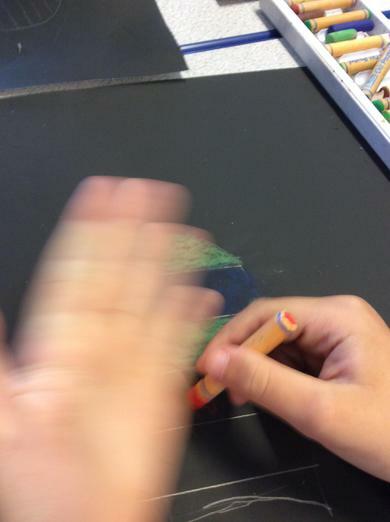 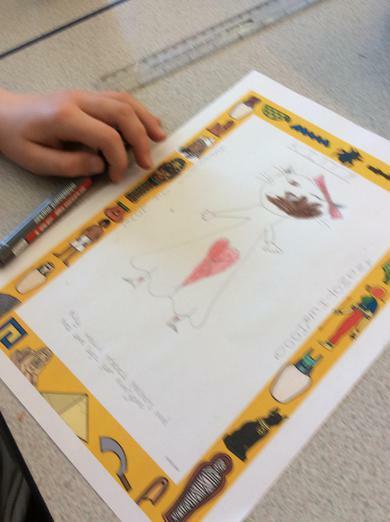 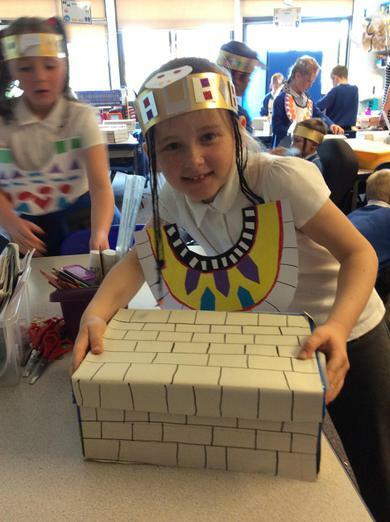 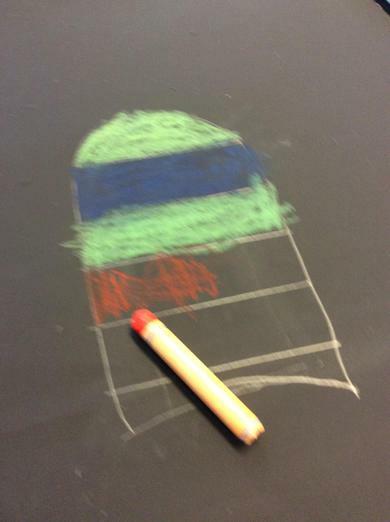 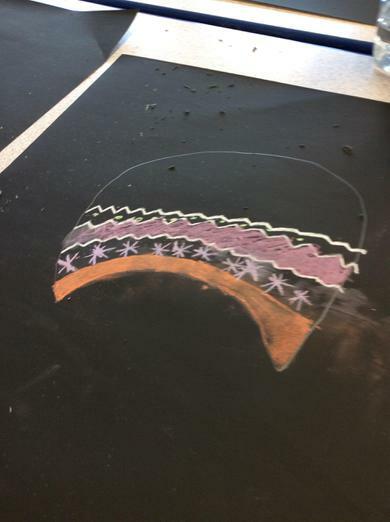 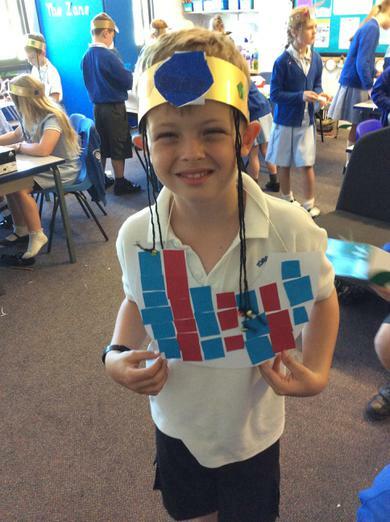 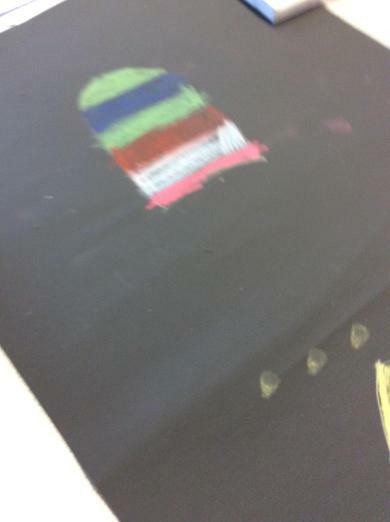 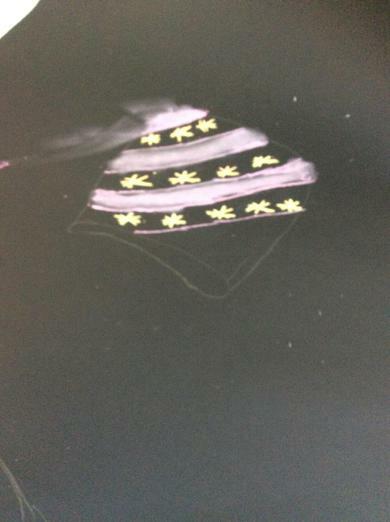 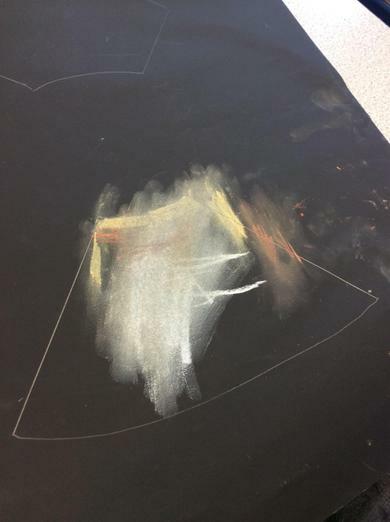 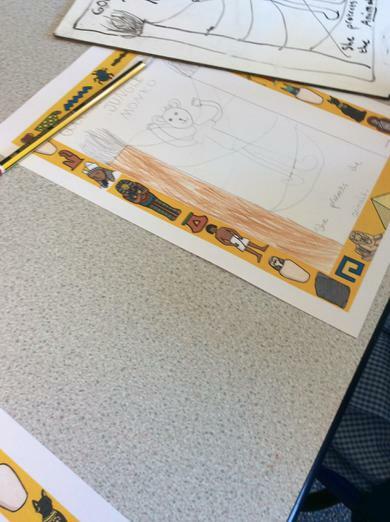 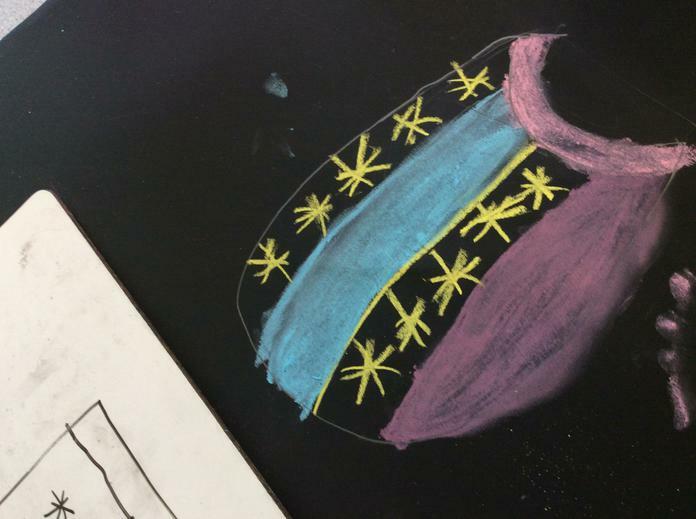 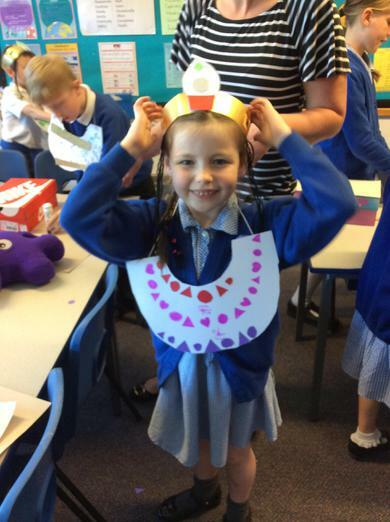 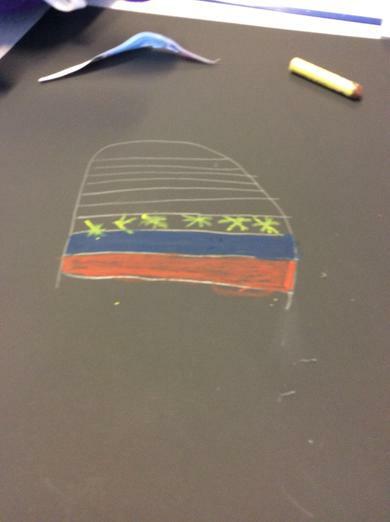 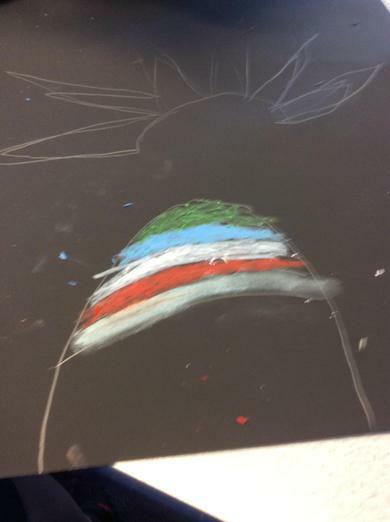 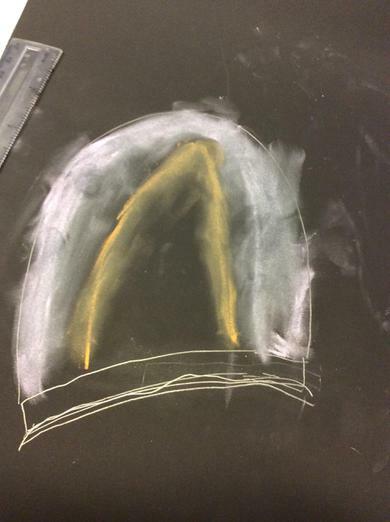 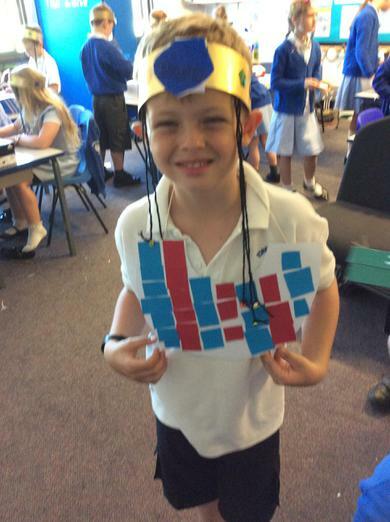 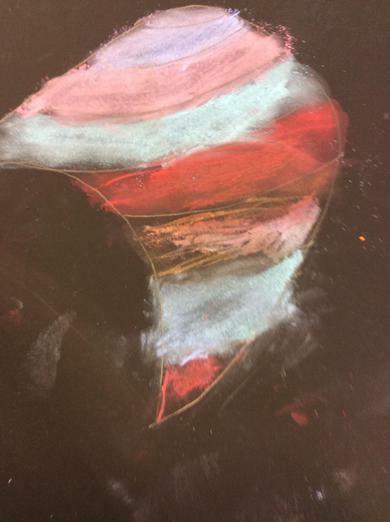 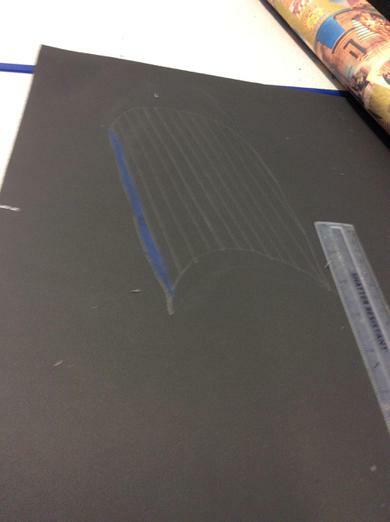 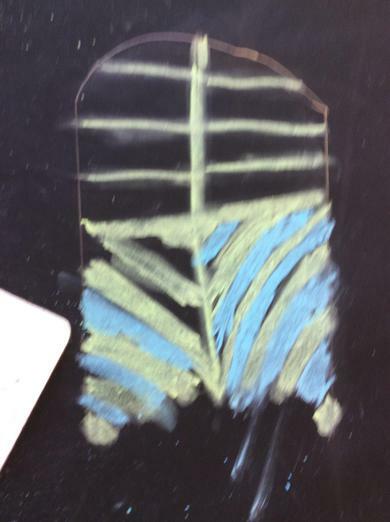 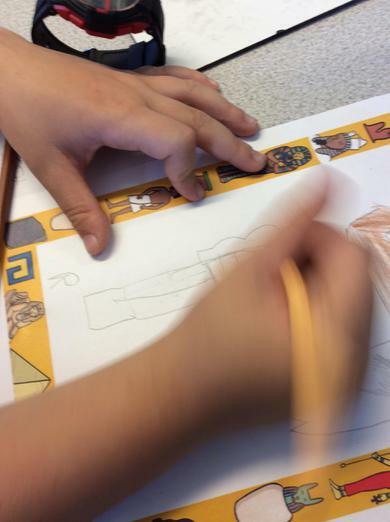 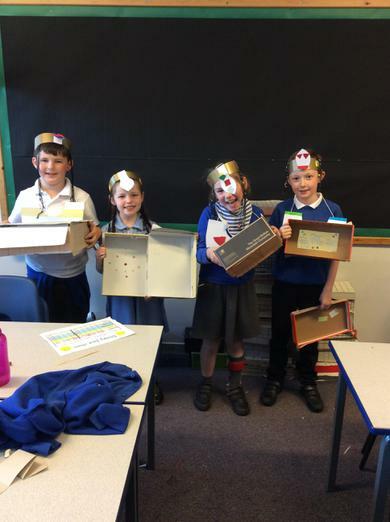 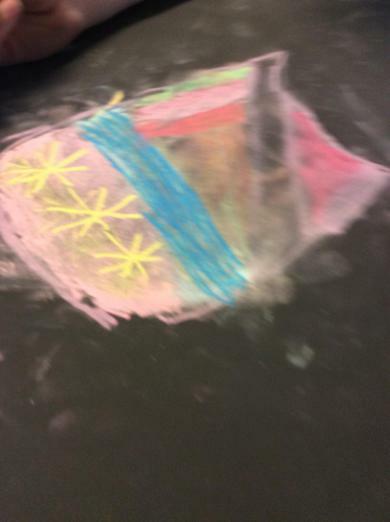 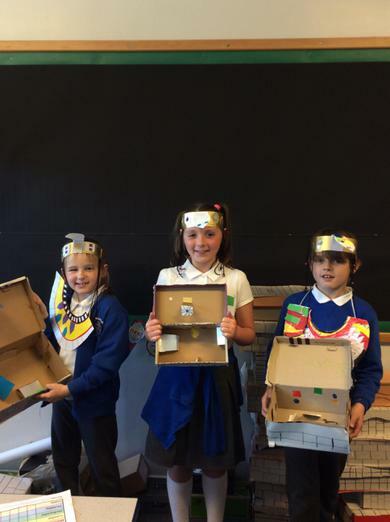 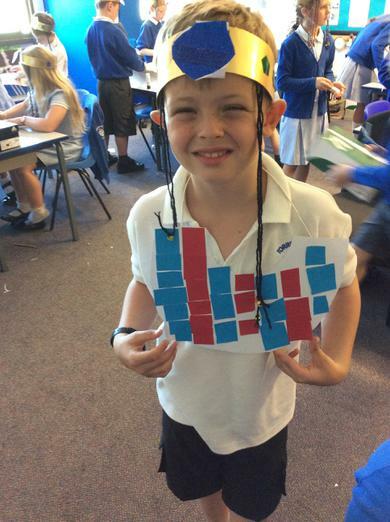 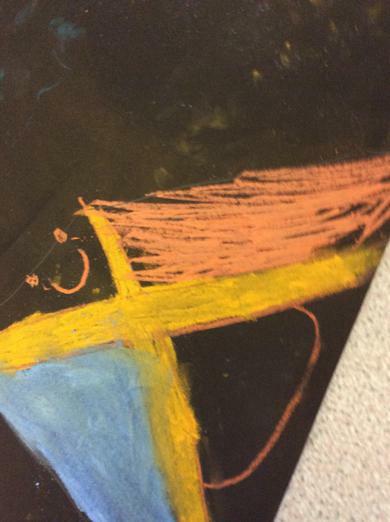 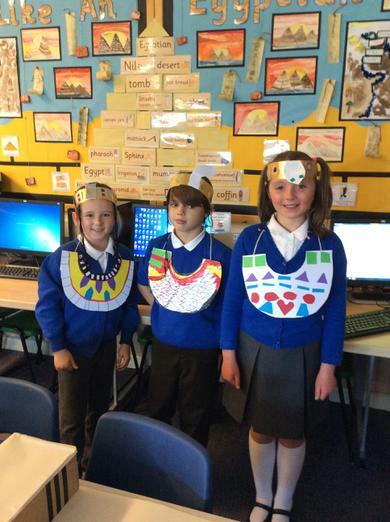 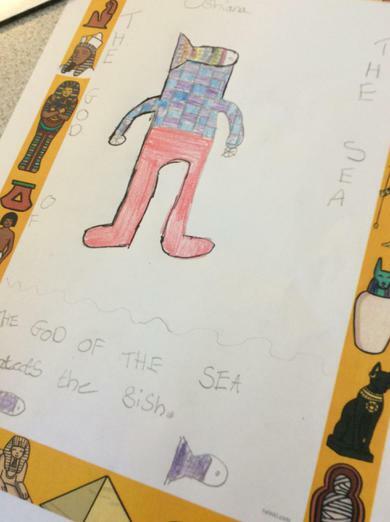 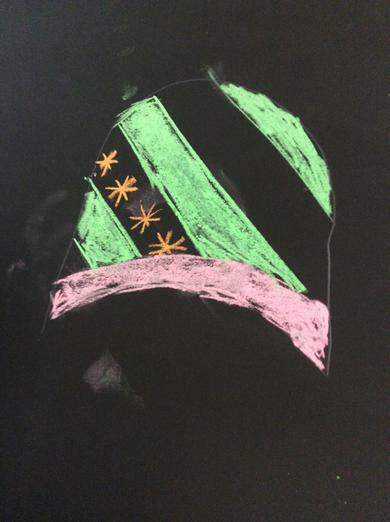 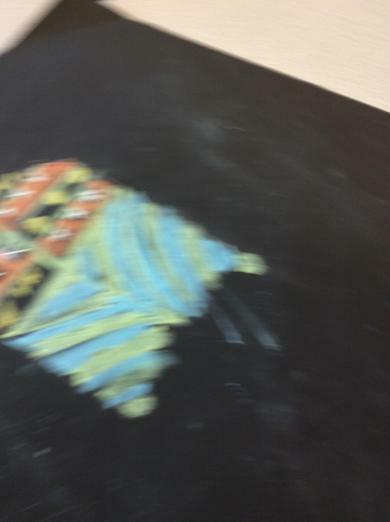 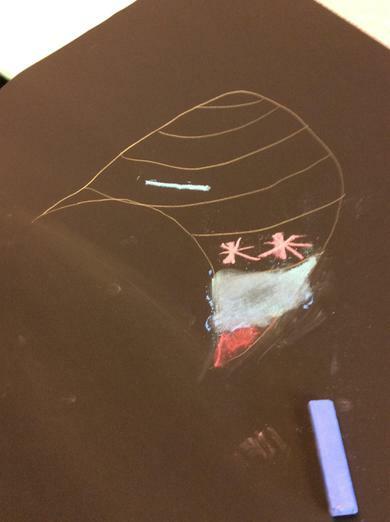 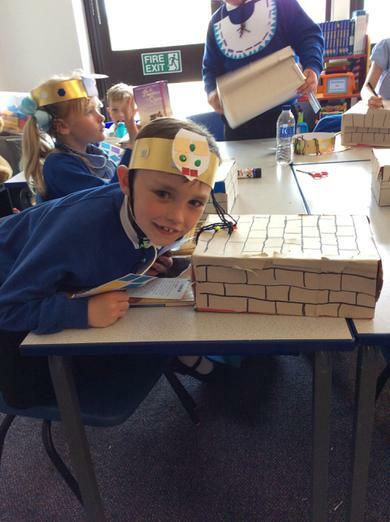 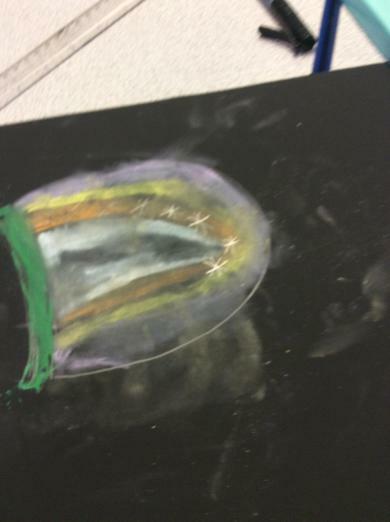 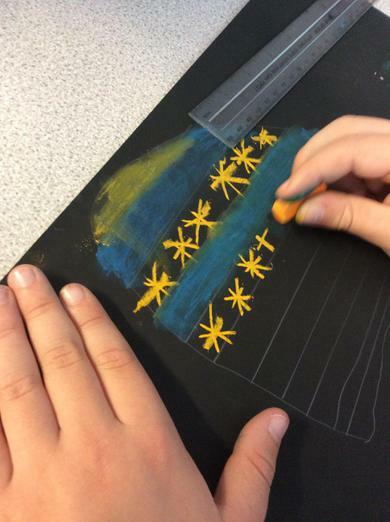 Today we created our own Egyptian headdress picture! 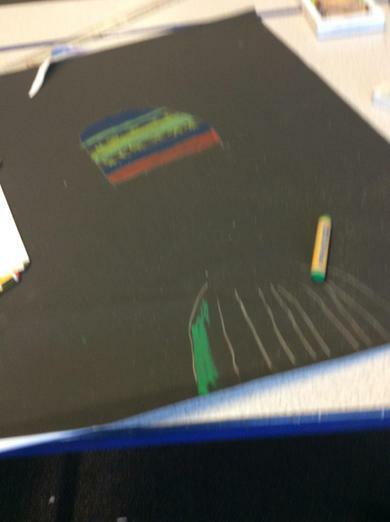 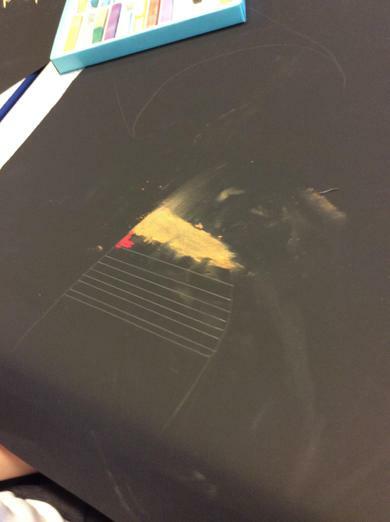 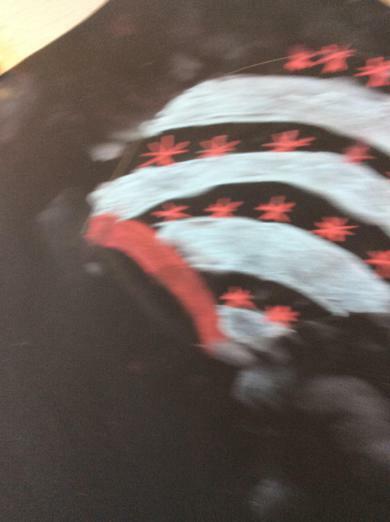 Wait until you see them completed. 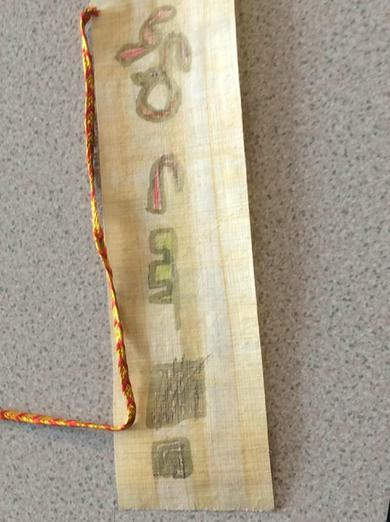 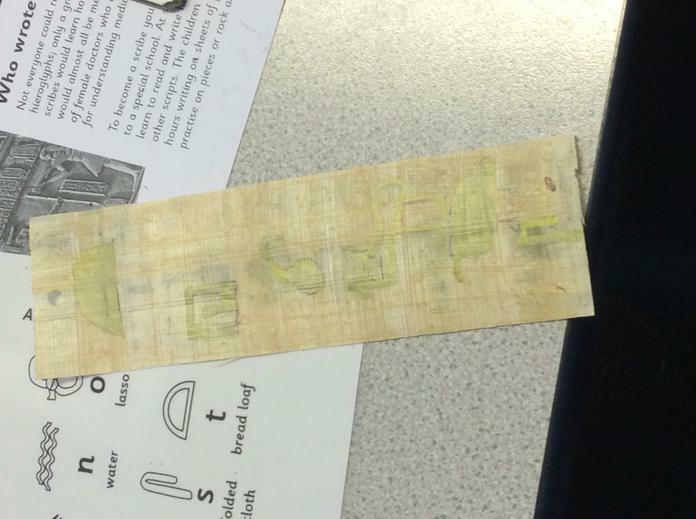 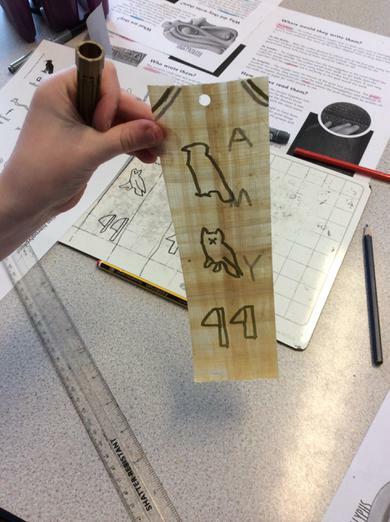 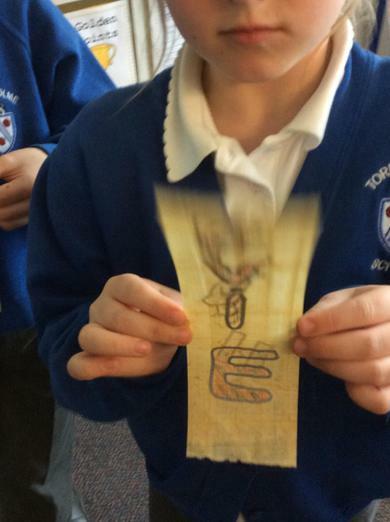 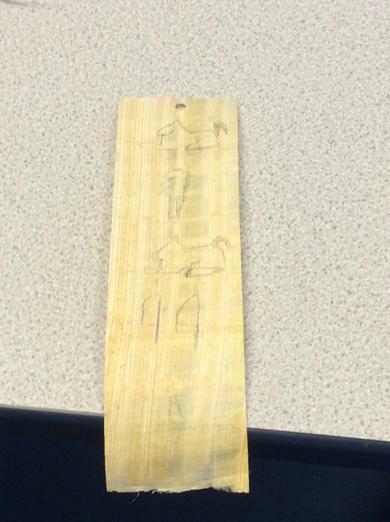 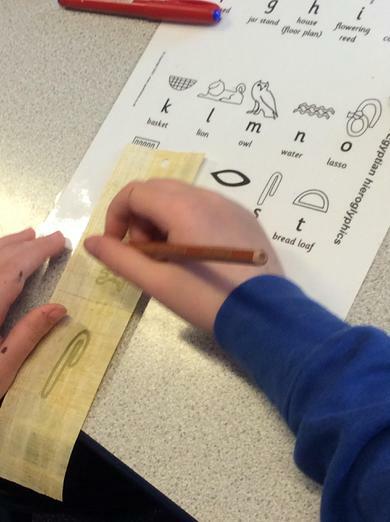 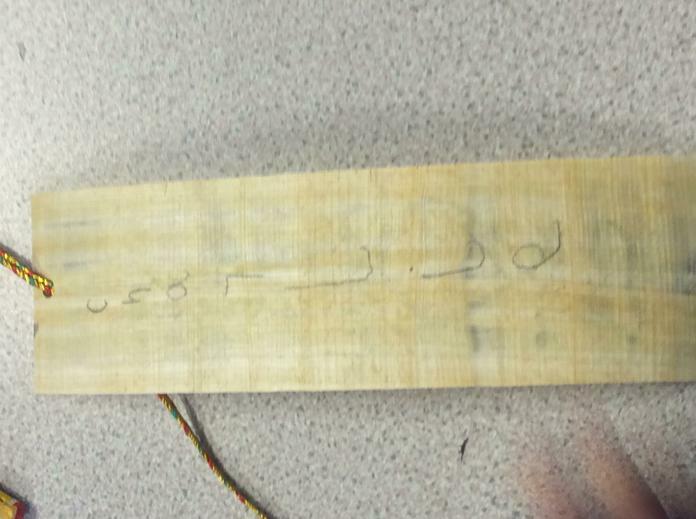 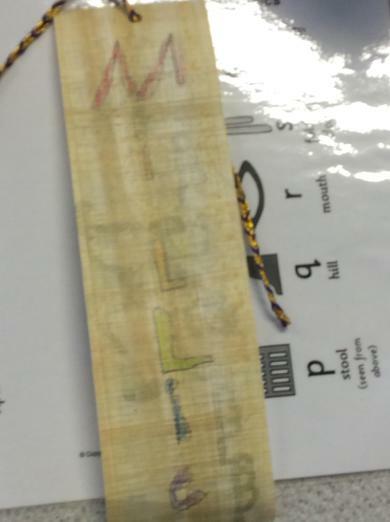 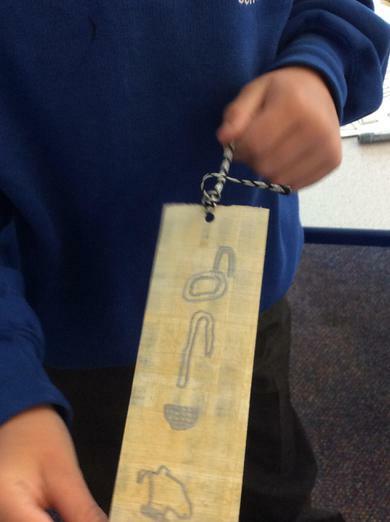 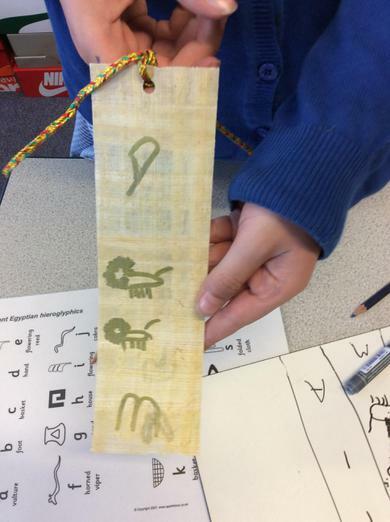 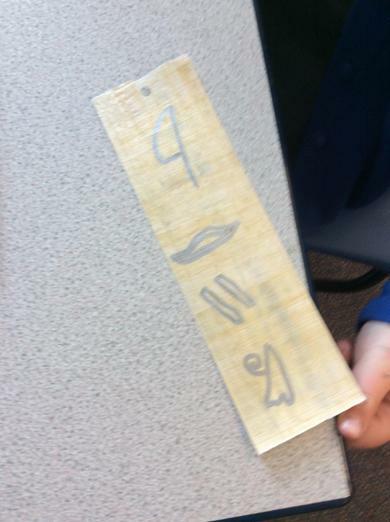 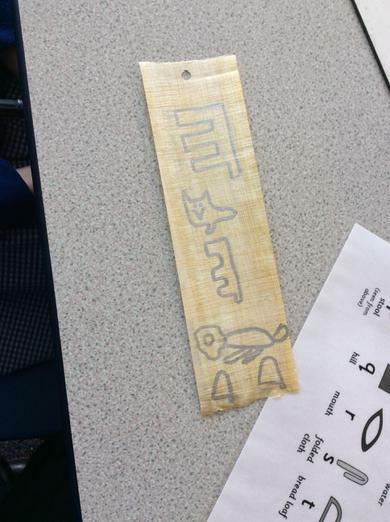 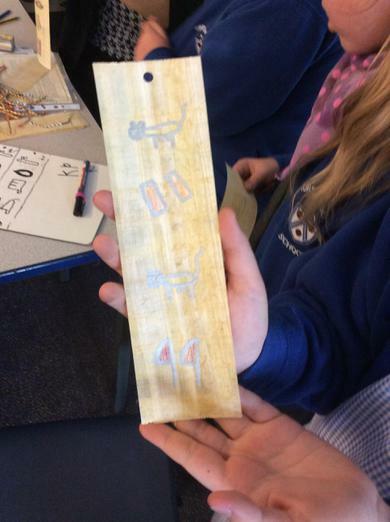 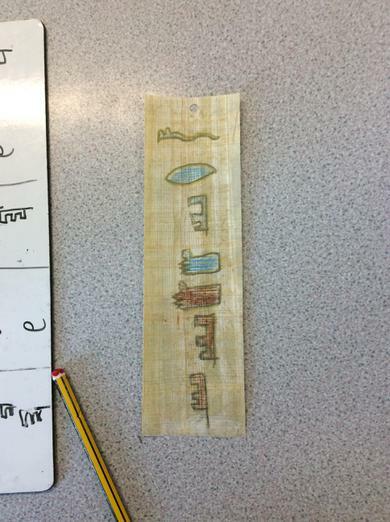 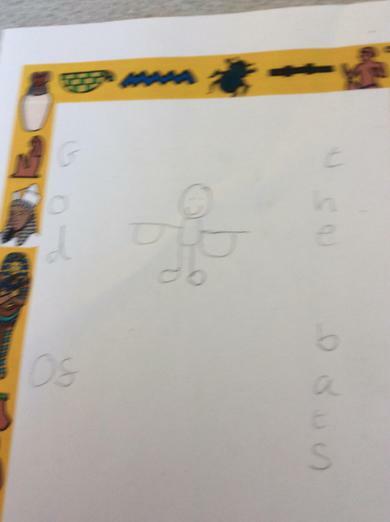 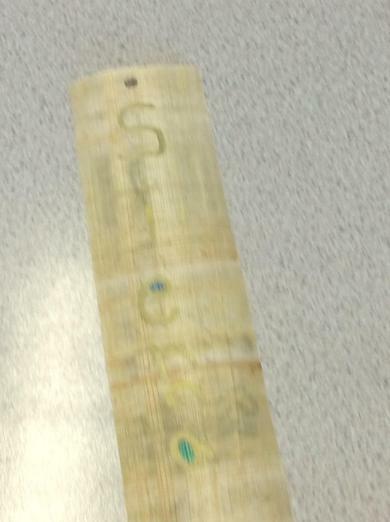 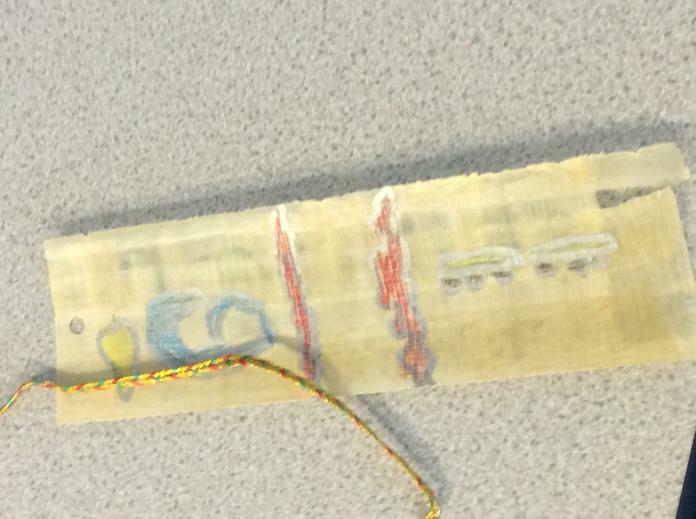 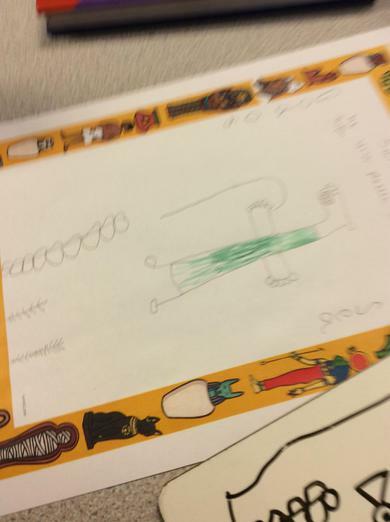 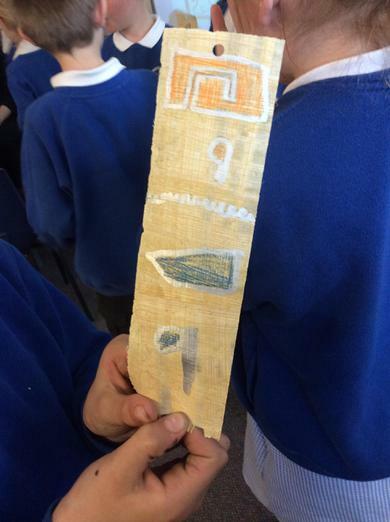 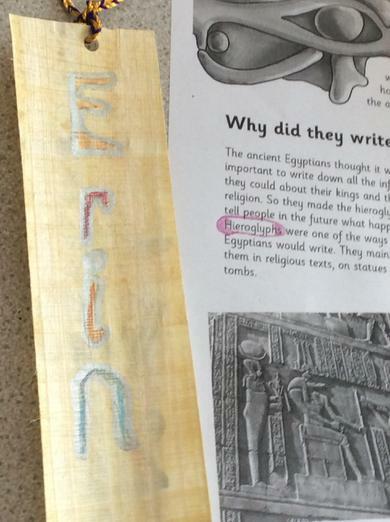 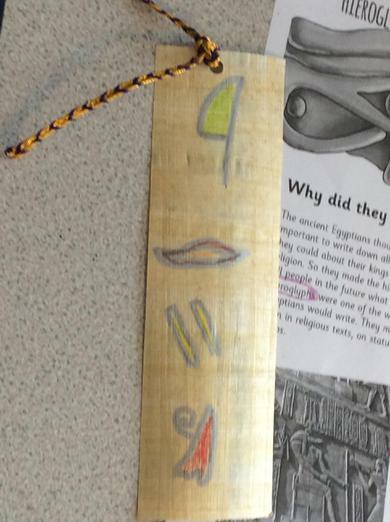 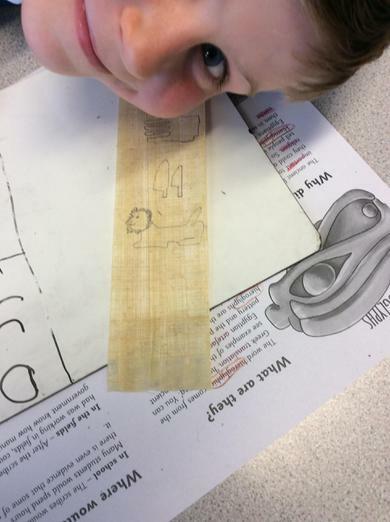 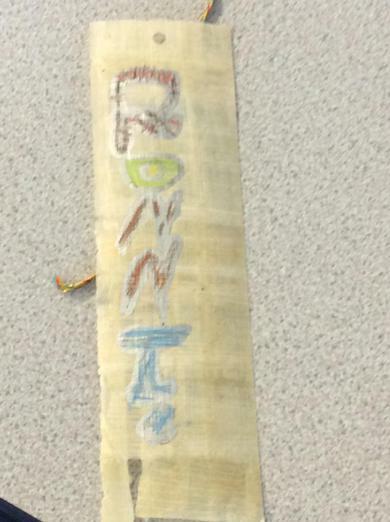 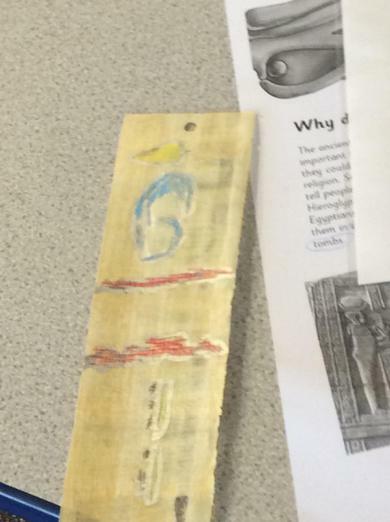 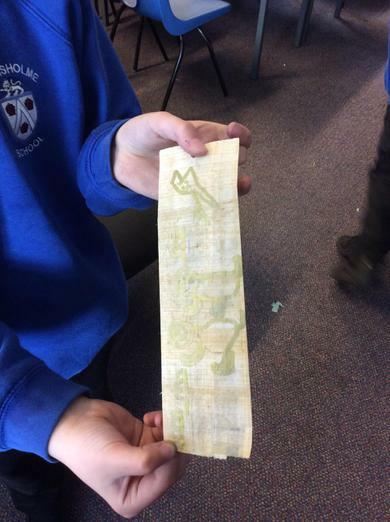 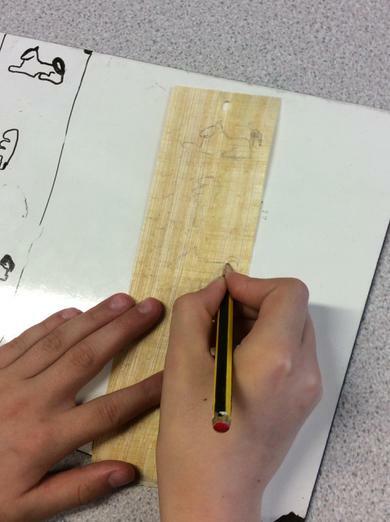 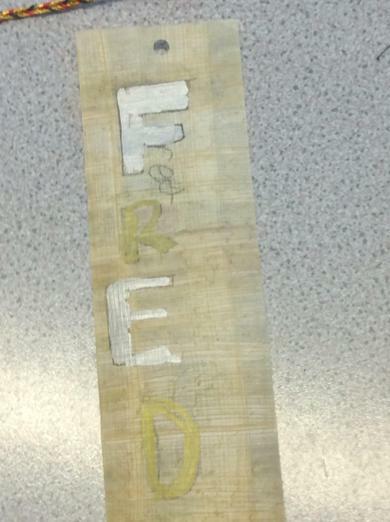 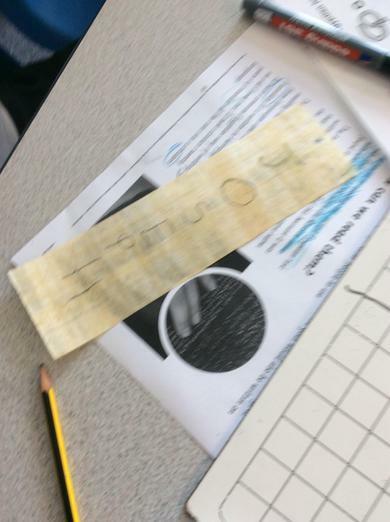 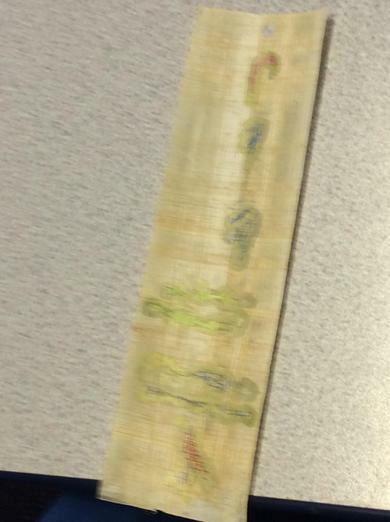 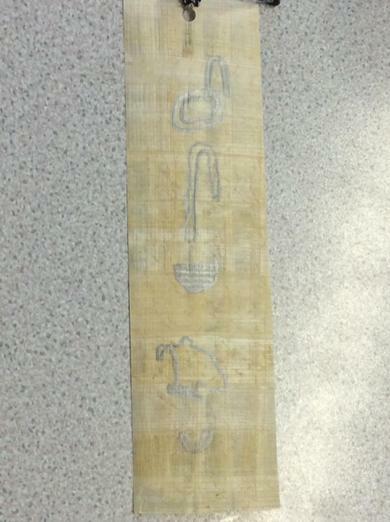 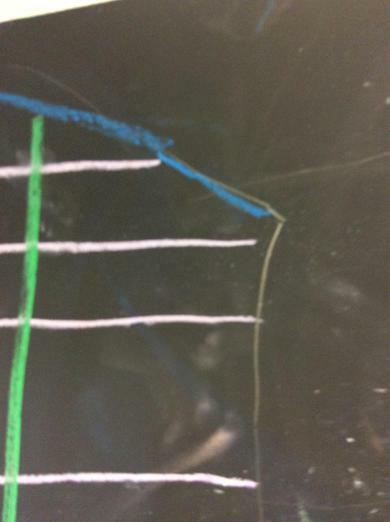 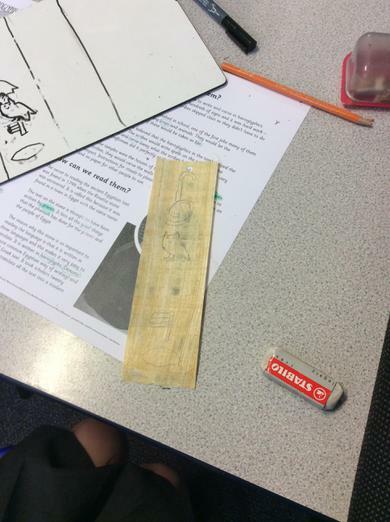 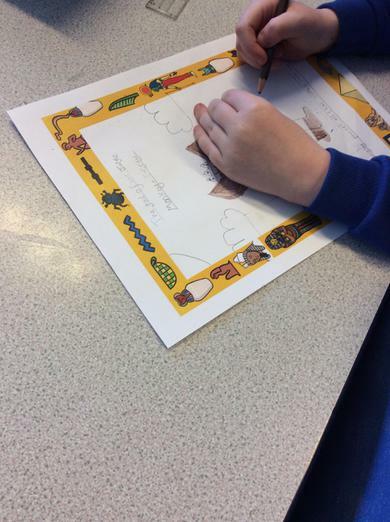 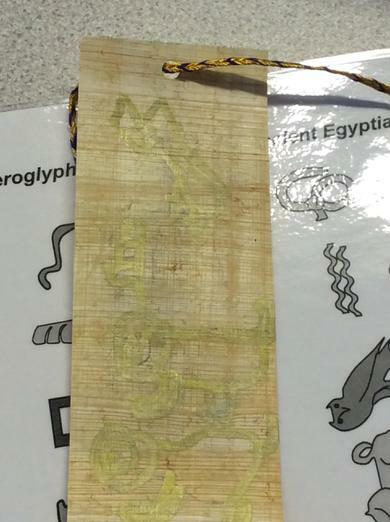 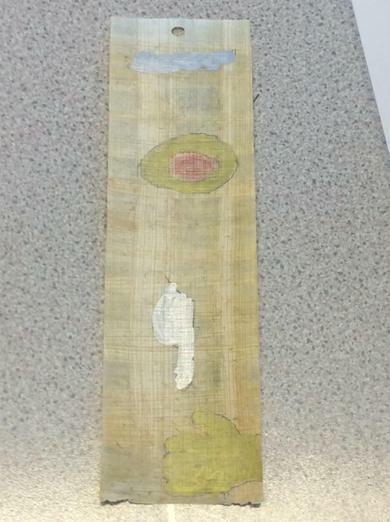 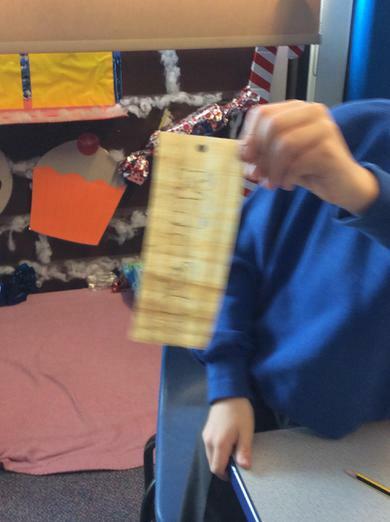 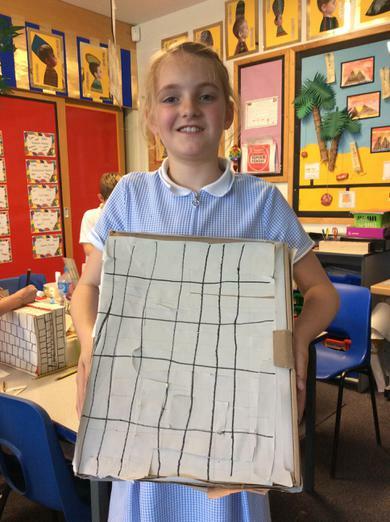 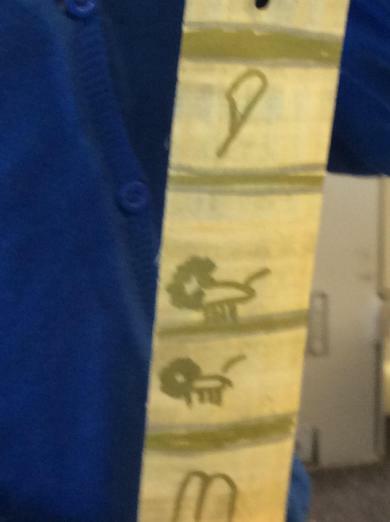 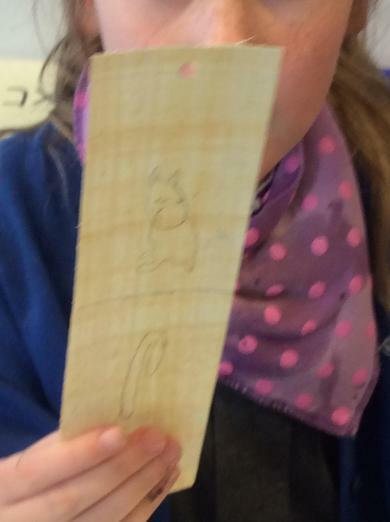 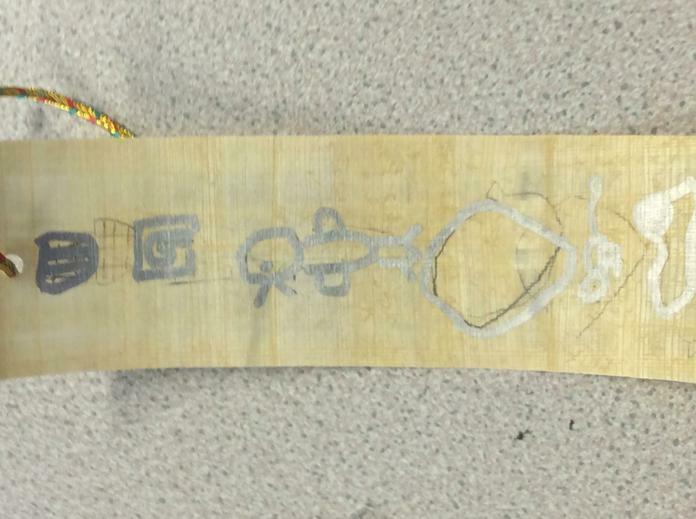 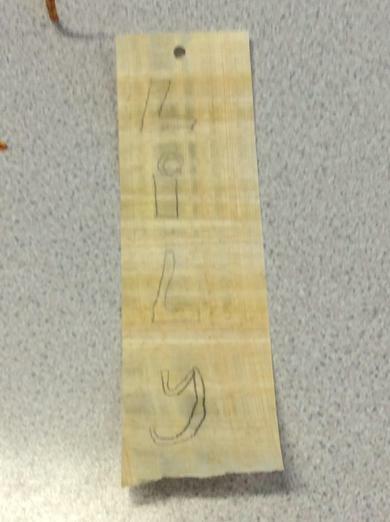 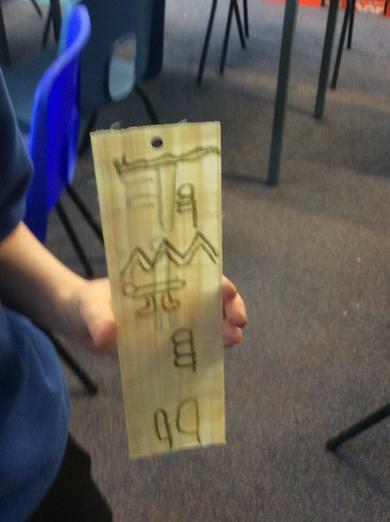 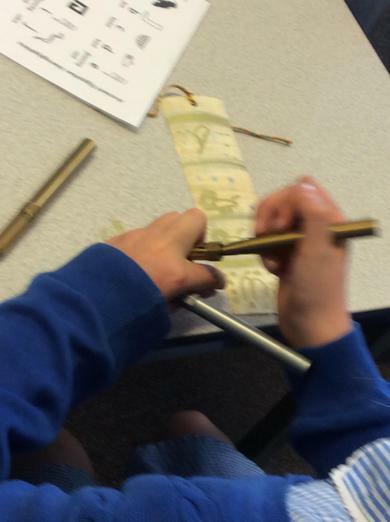 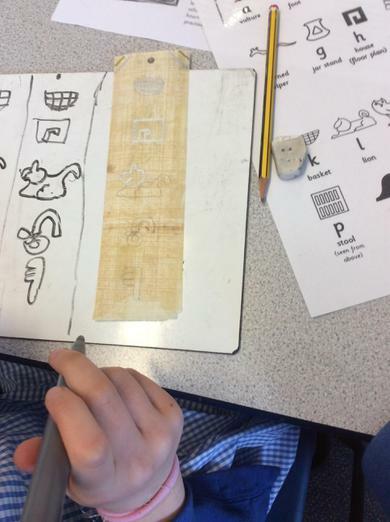 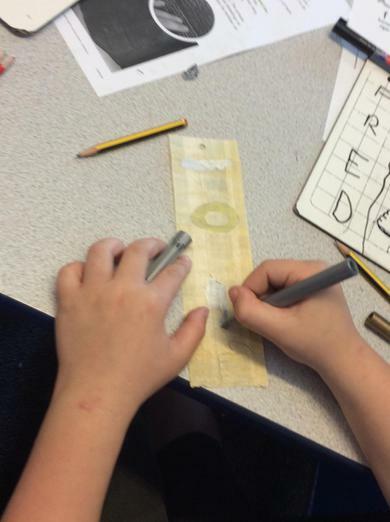 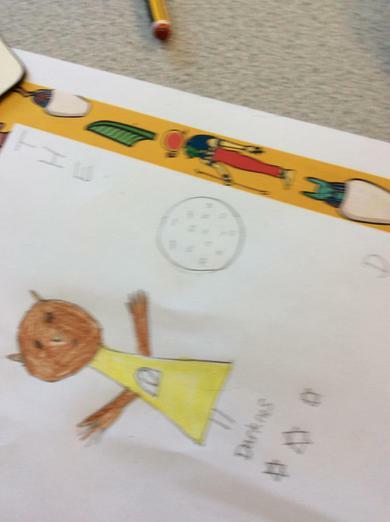 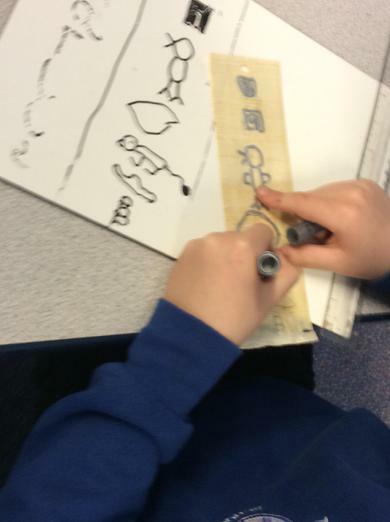 We have been writing our name using hieroglyphs on papyrus. 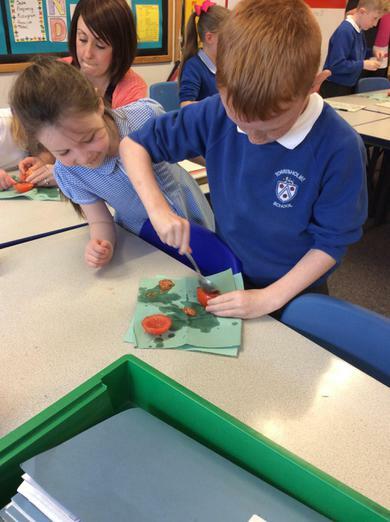 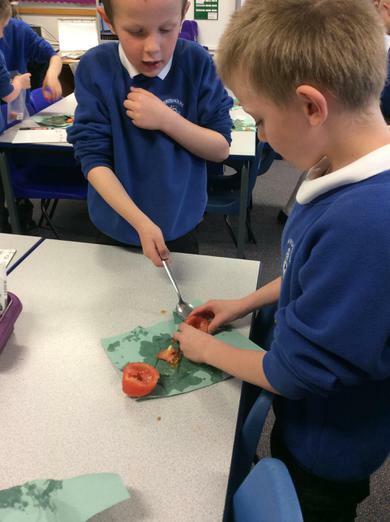 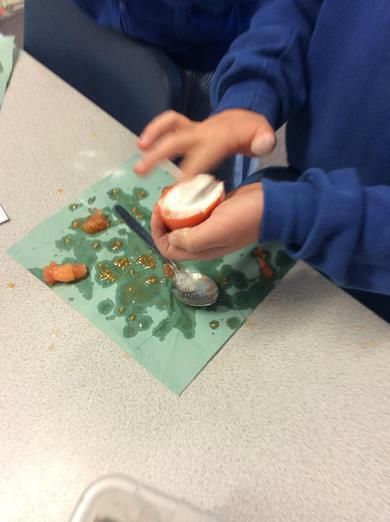 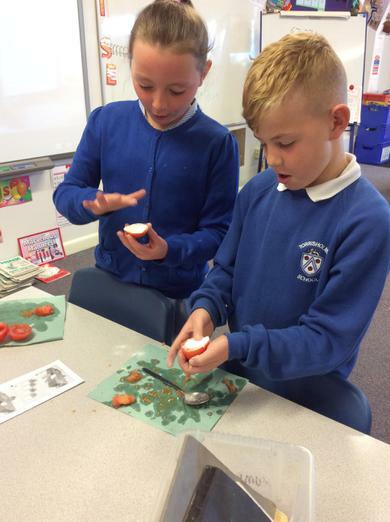 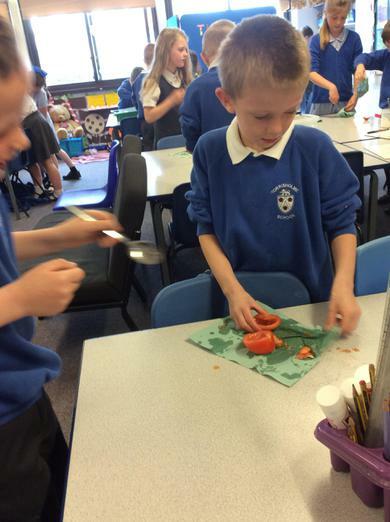 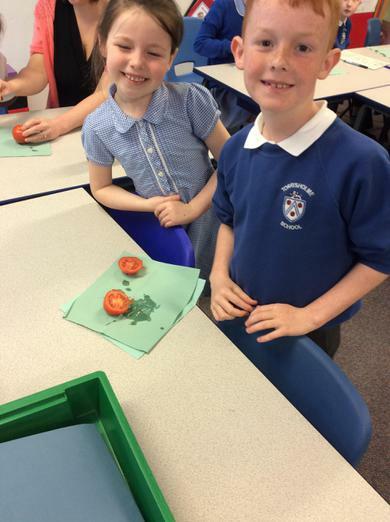 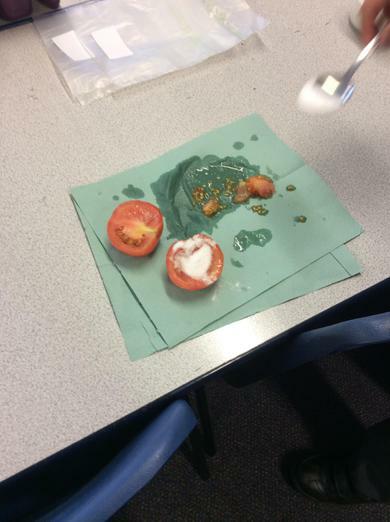 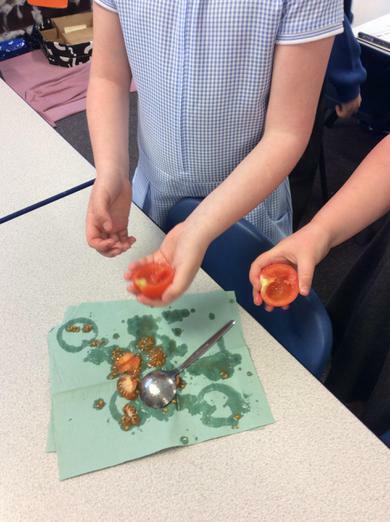 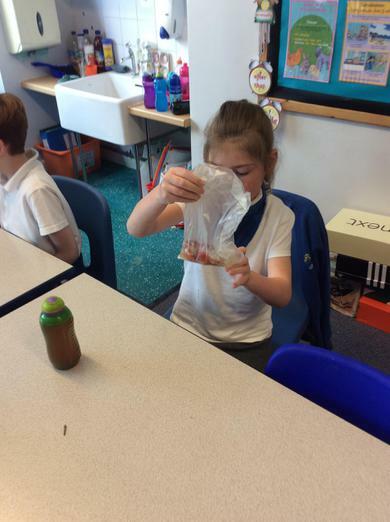 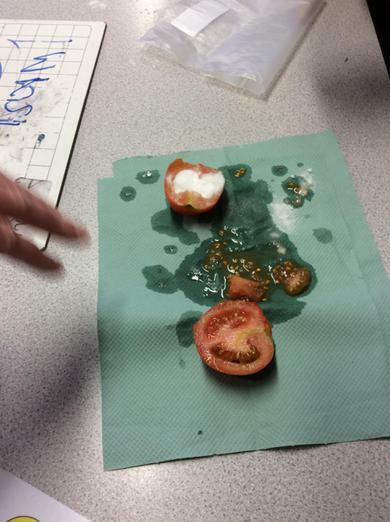 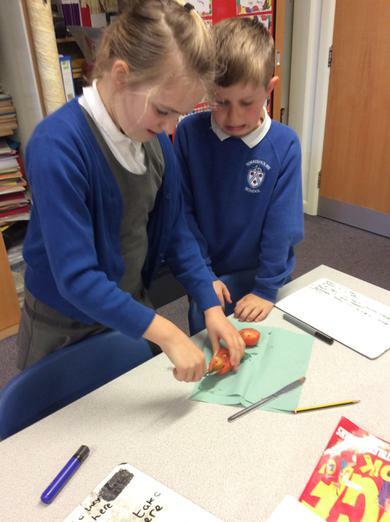 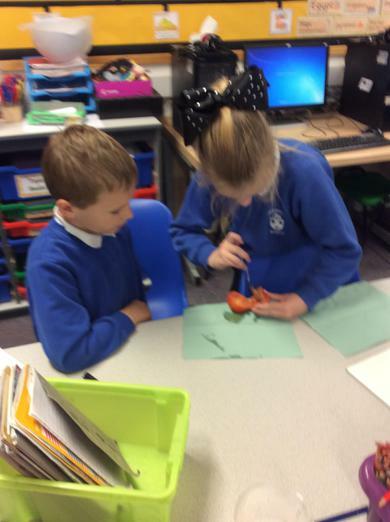 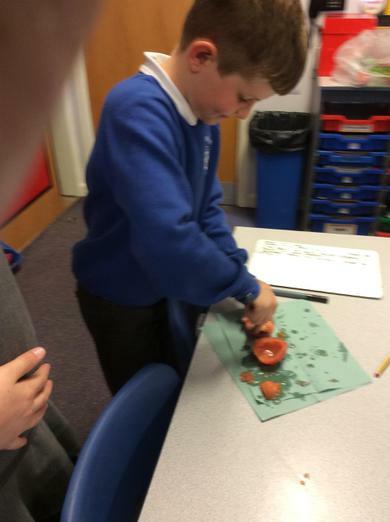 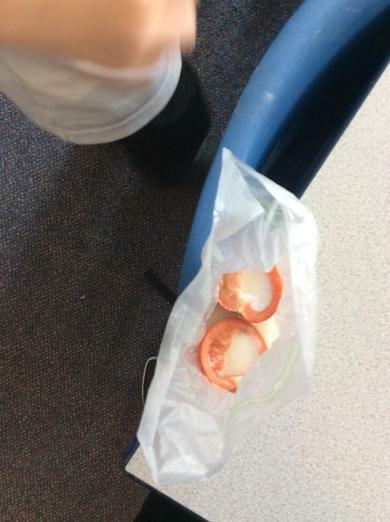 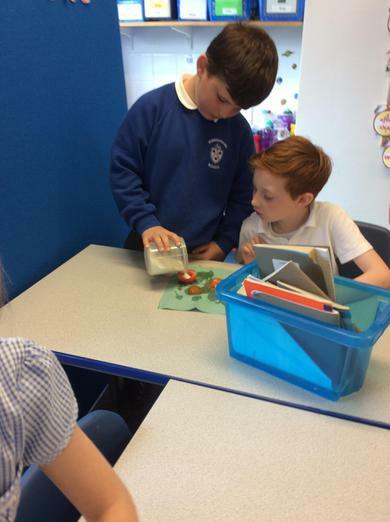 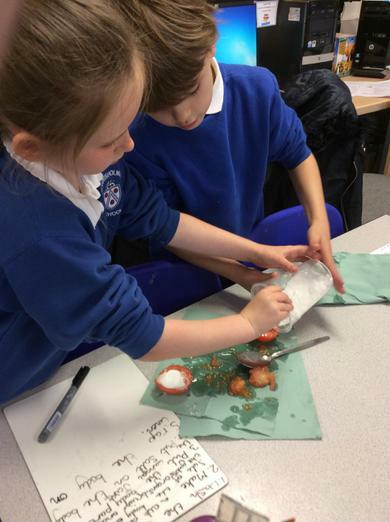 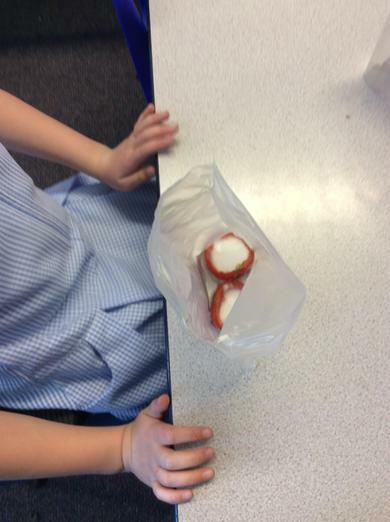 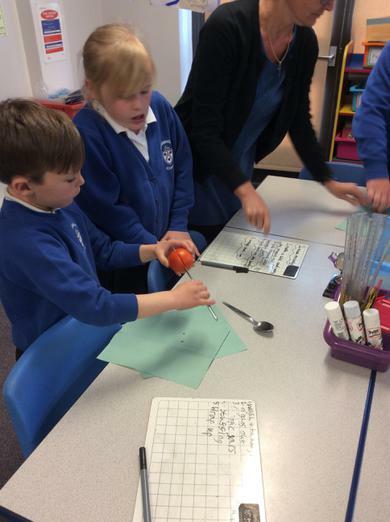 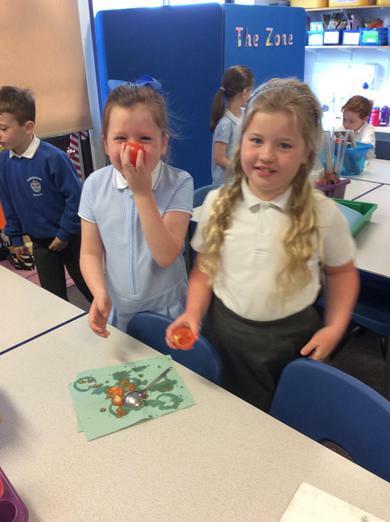 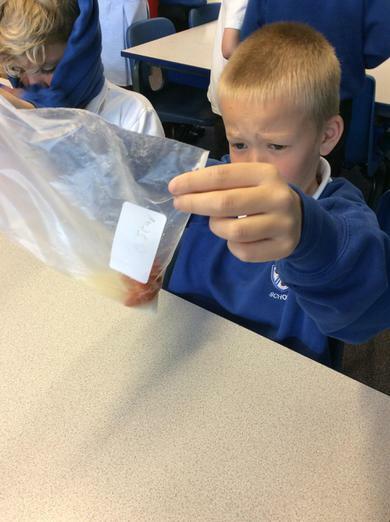 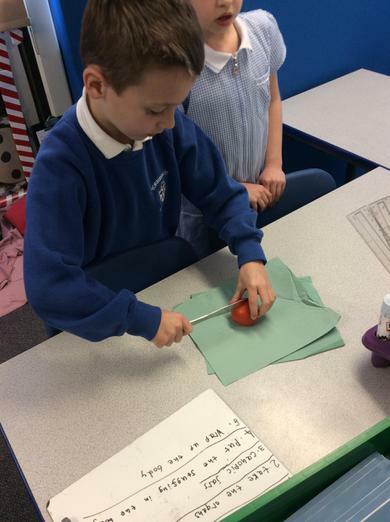 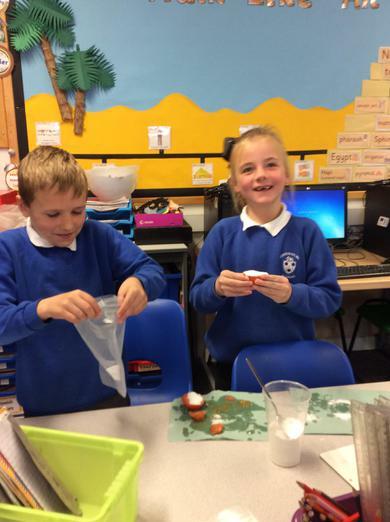 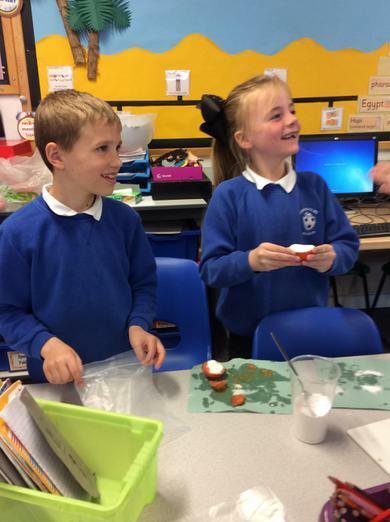 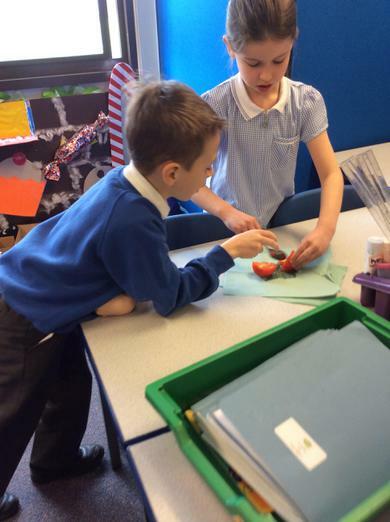 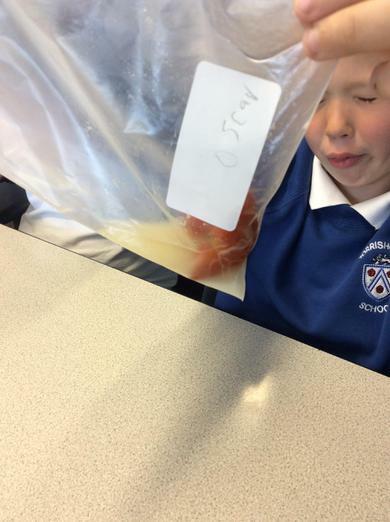 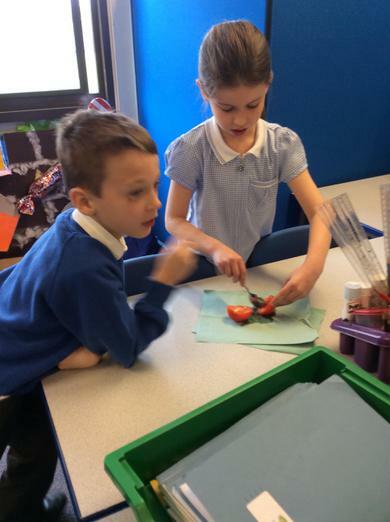 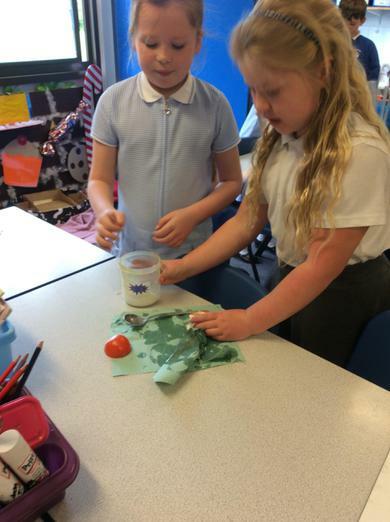 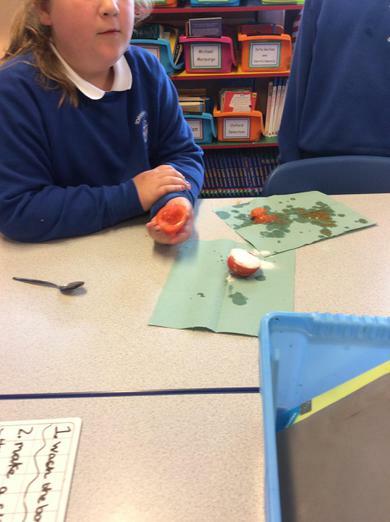 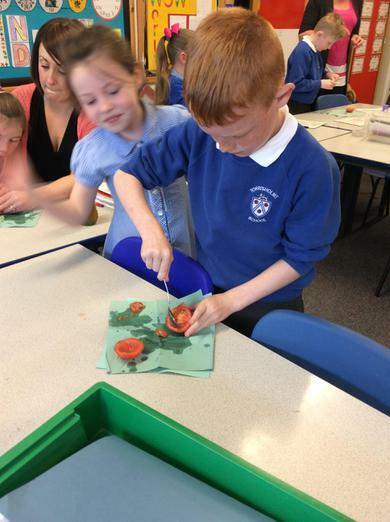 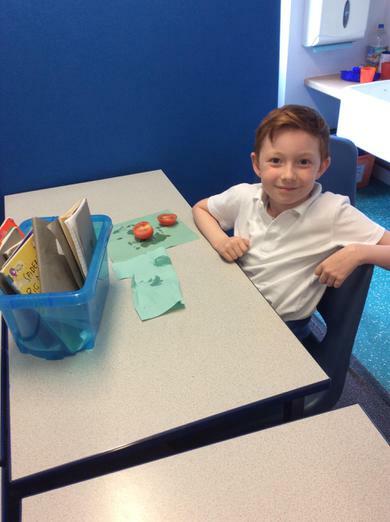 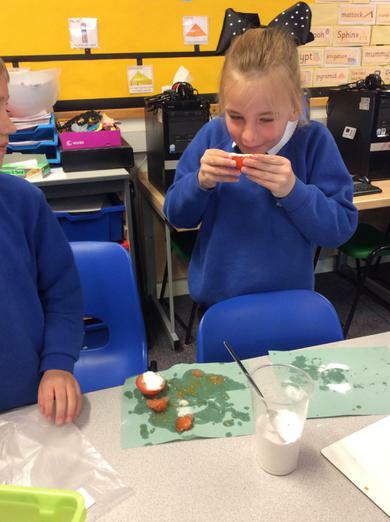 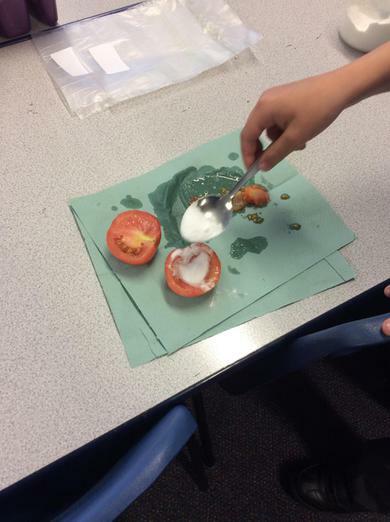 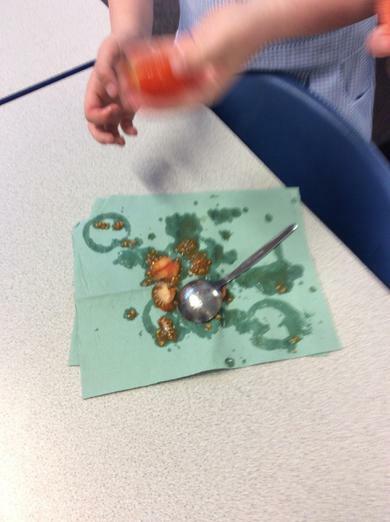 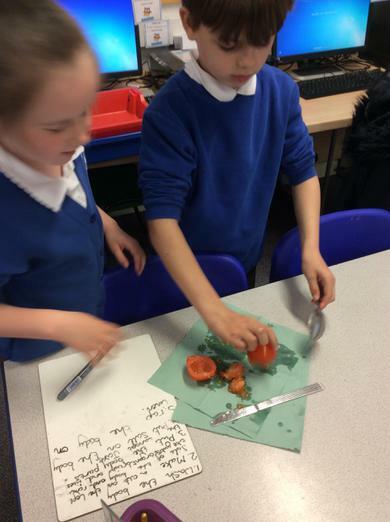 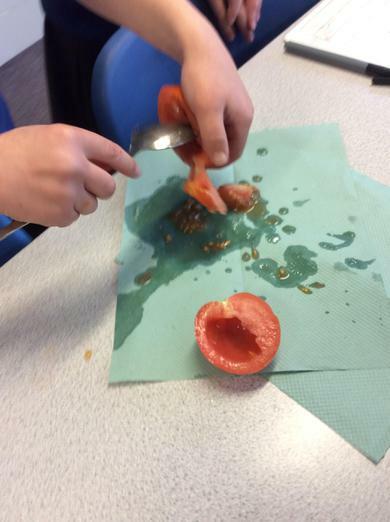 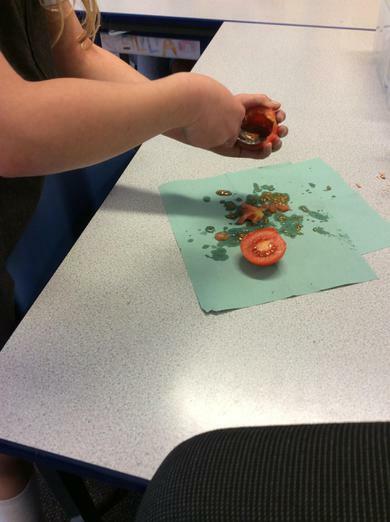 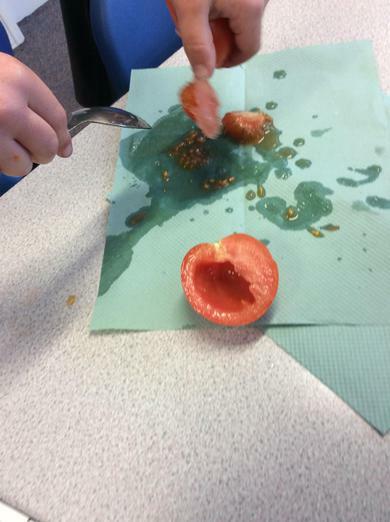 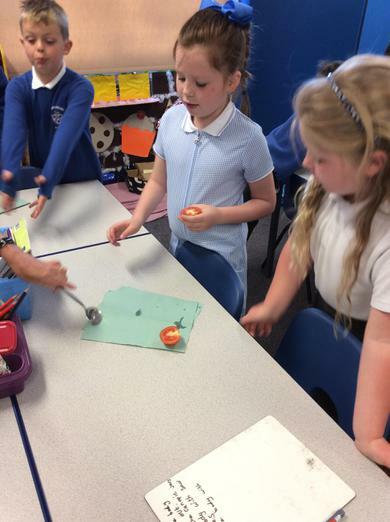 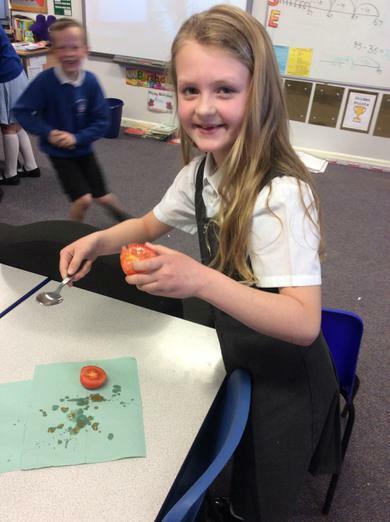 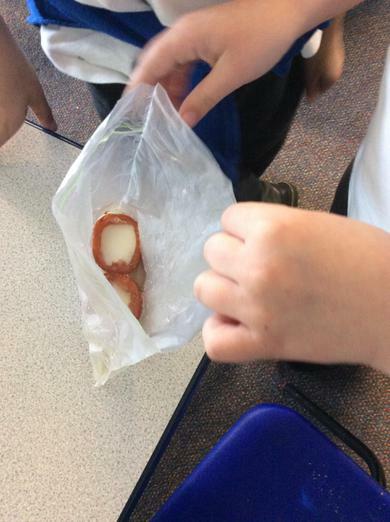 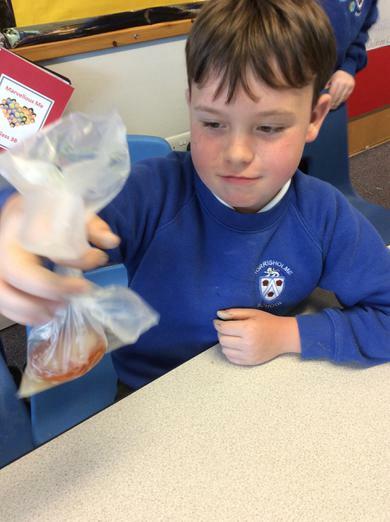 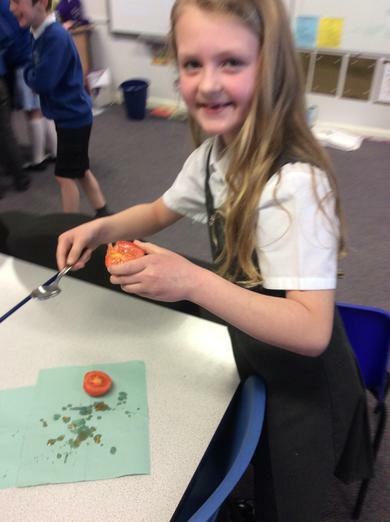 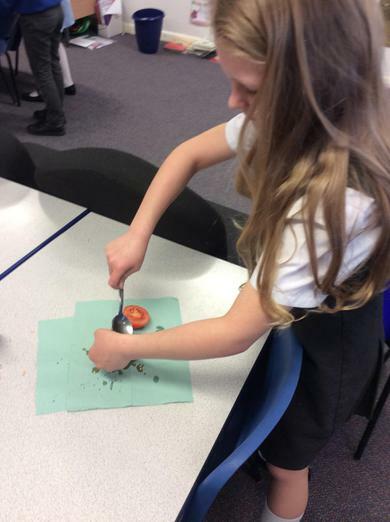 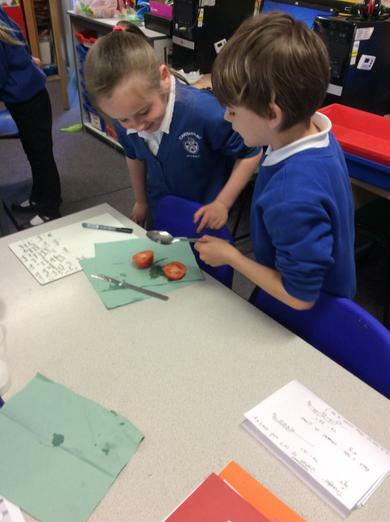 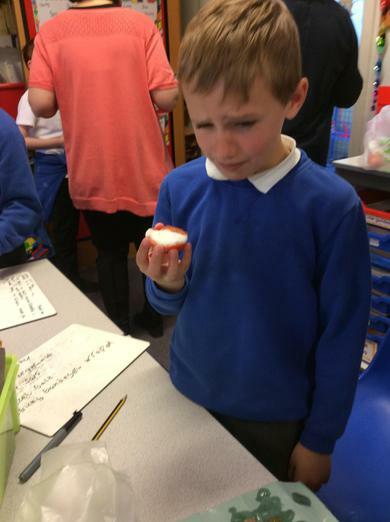 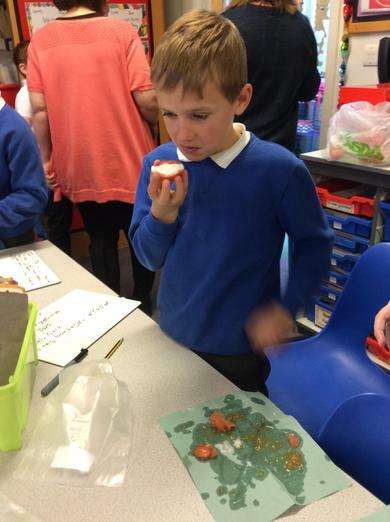 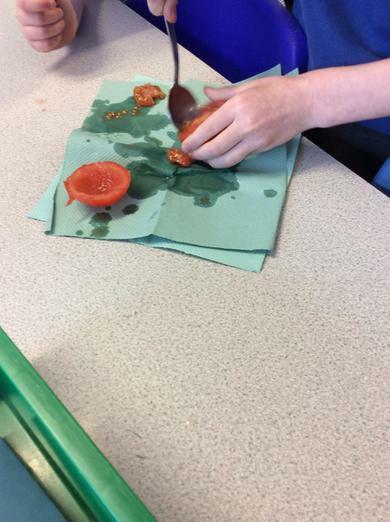 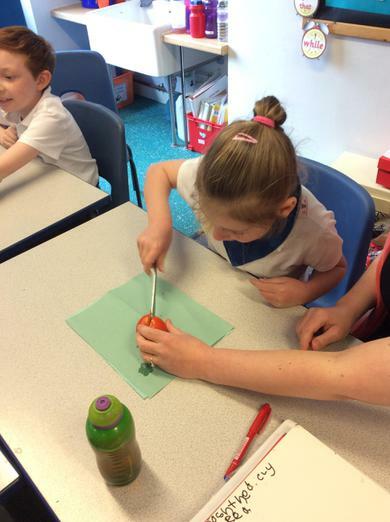 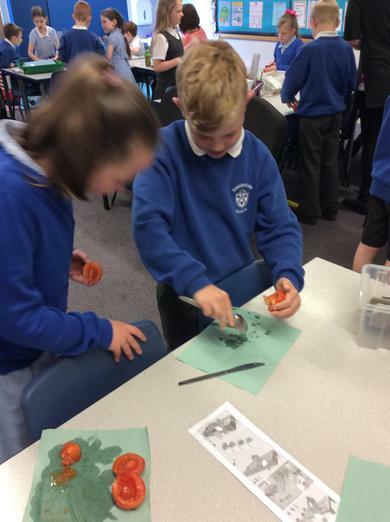 We have checked on our tomatoes to see how well they have been preserved! 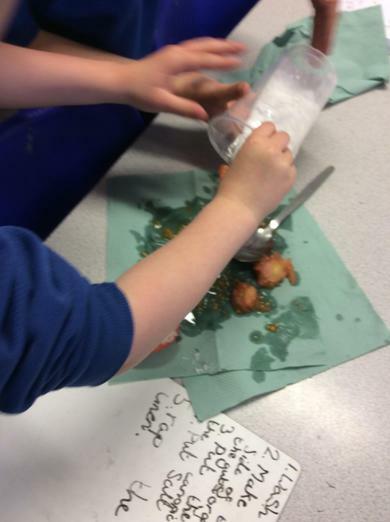 All the juice is escaping as the natron salt is drying them out. 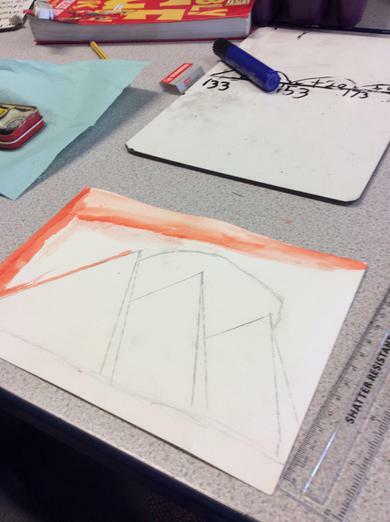 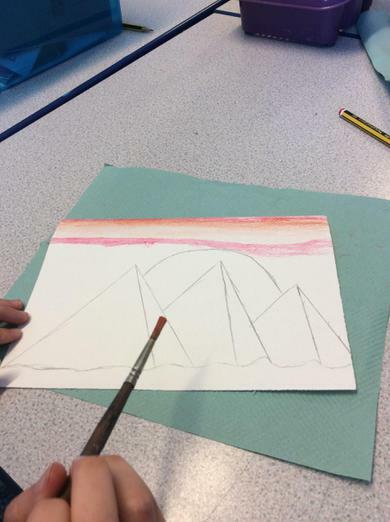 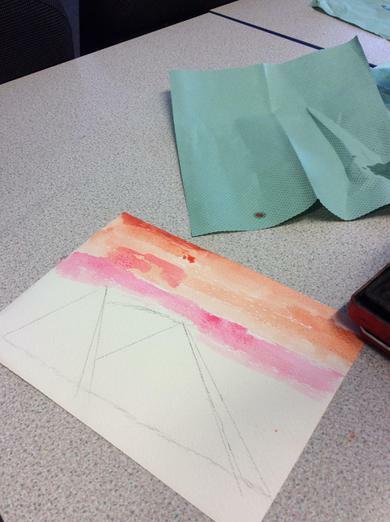 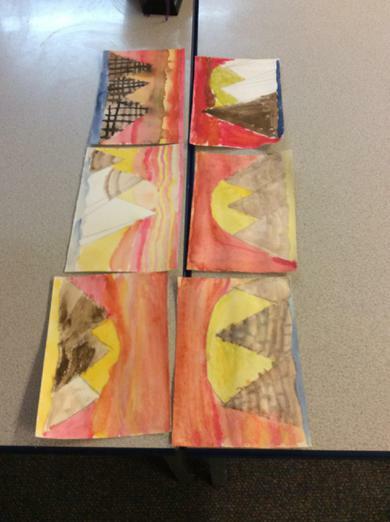 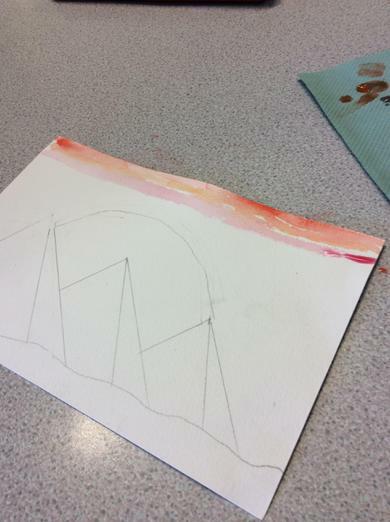 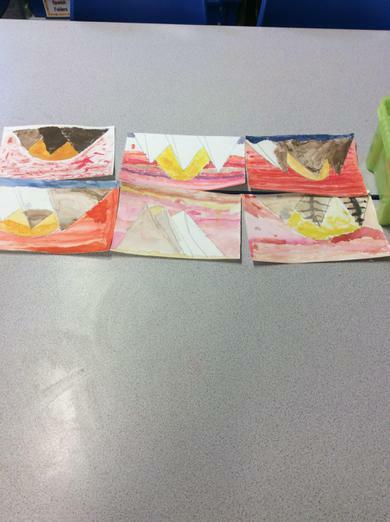 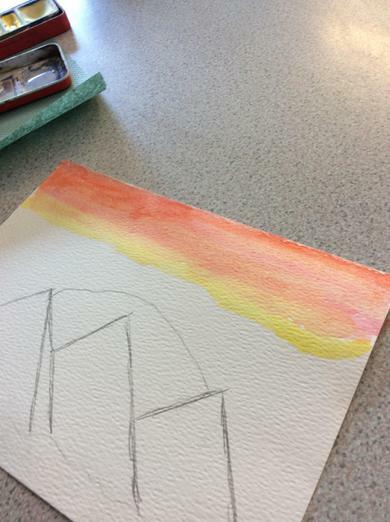 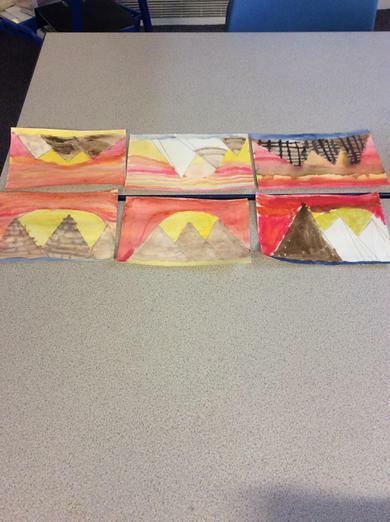 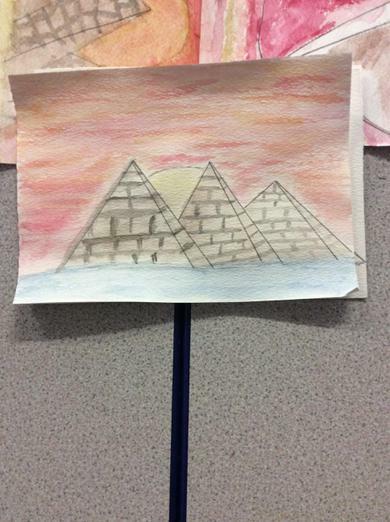 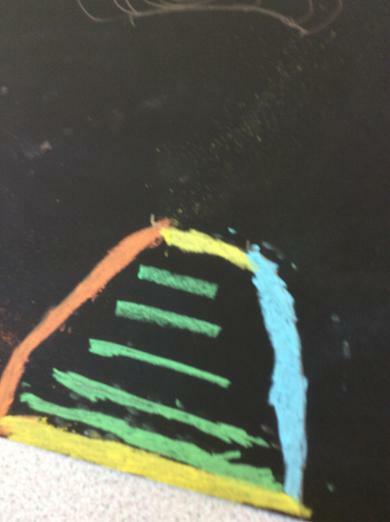 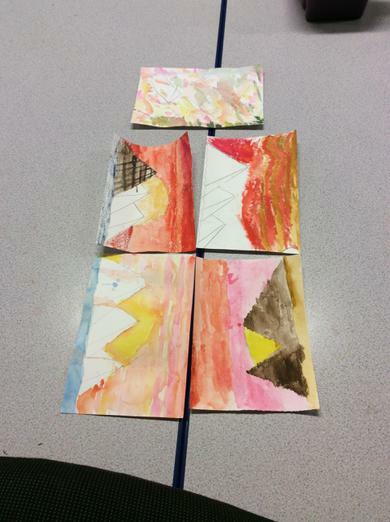 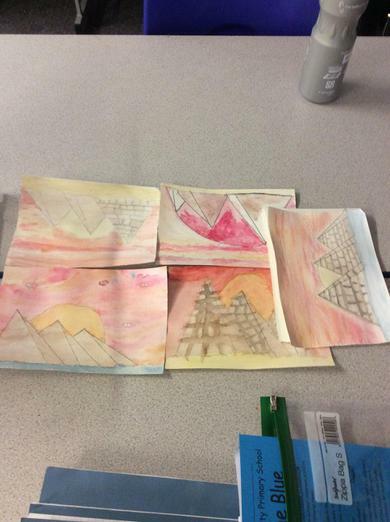 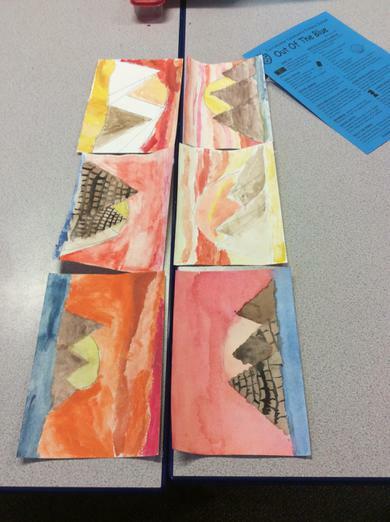 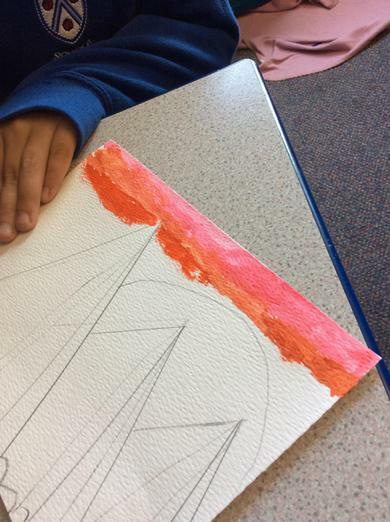 The children have done an amazing job with their watercolour pyramid paintings!